I’m getting worse at this blogging thing, I fear. I spend less and less time on this, as I have more time for family, friends in the Des Moines area, and house projects like its my job. Let’s take a quick peek at what has been going on around here this week. Cooking and baking. I have had an aha-duh moment this week. If Greta helps me prepare the food, she eats much more willingly. We have made cookies, corn on the cob, green beans, mac and cheese, and finally this lovely zucchini dish. This dish is great because you can easily swap out or in various ingredients. 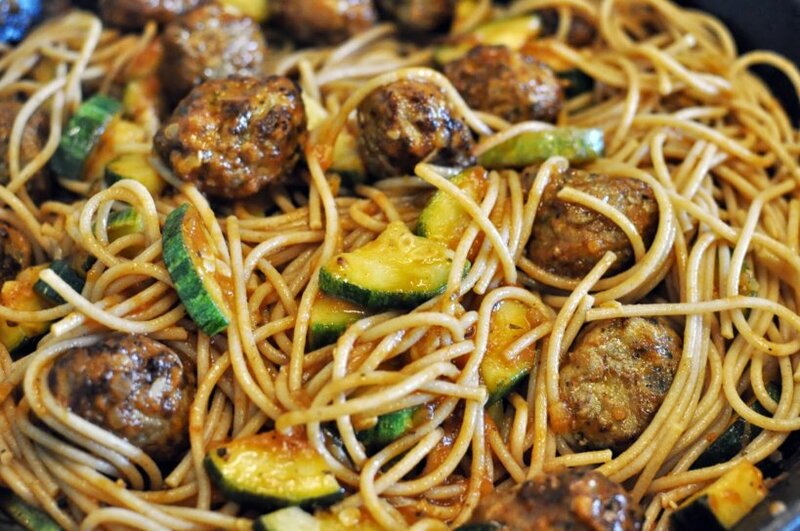 It can be made meat-free if you omit meatballs or use vegetarian meatballs. The brand Qorn has a really good ‘meatball’ made from fungi. Scroll down to the bottom of this post for the recipe. 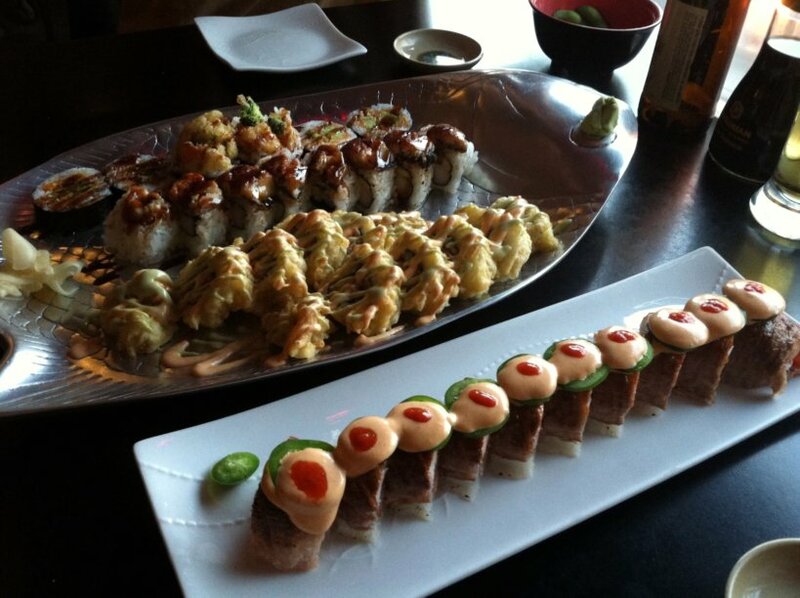 So good, I feel like licking the screen. 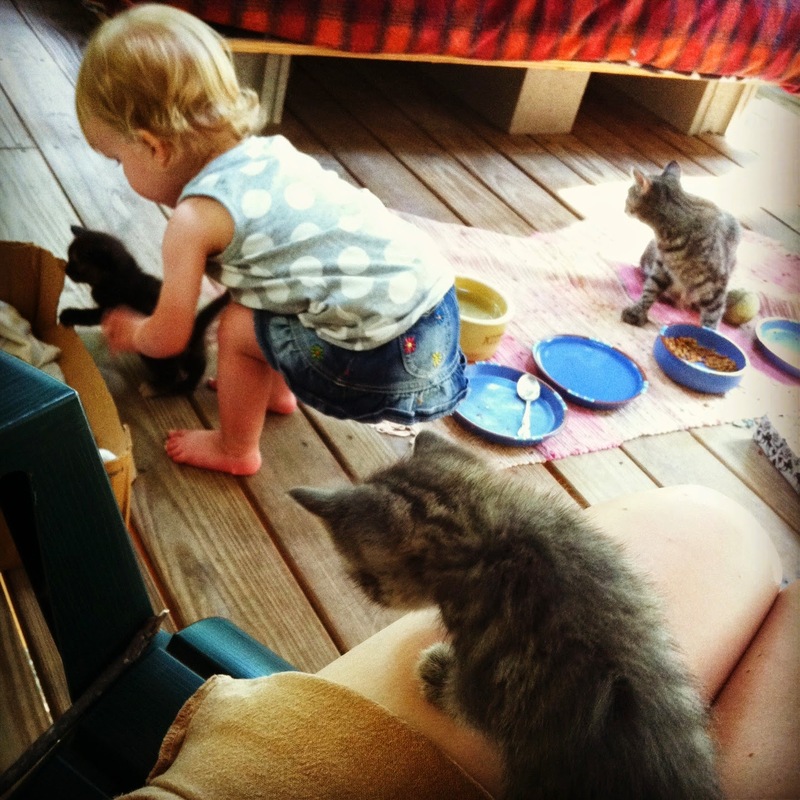 Another bonus – it feeds a lot for just a little. 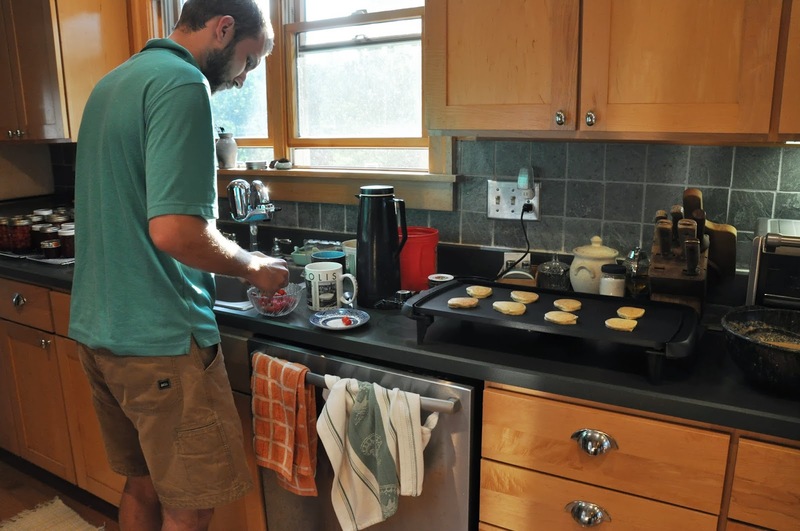 I will warn you though – this recipe is far from exact, I change it every time I make it. 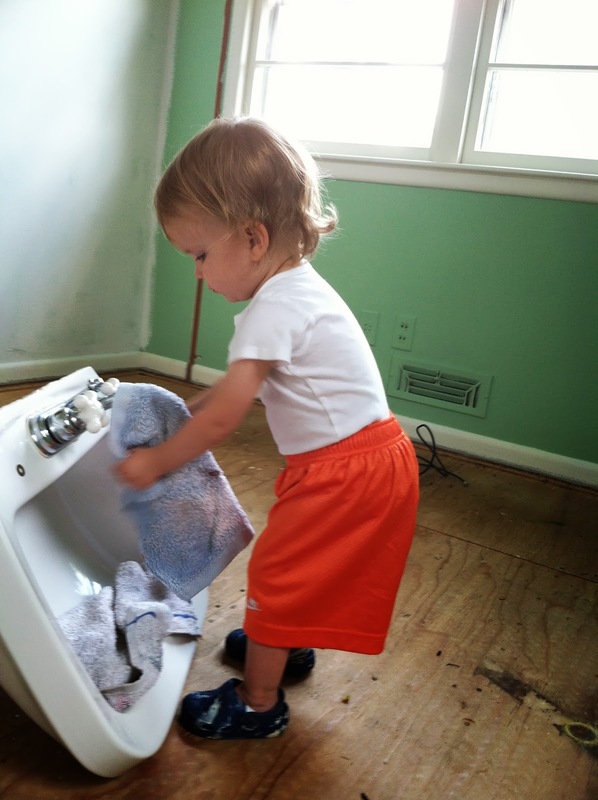 We also figured out that toddlers do not need toys – just everyday items. 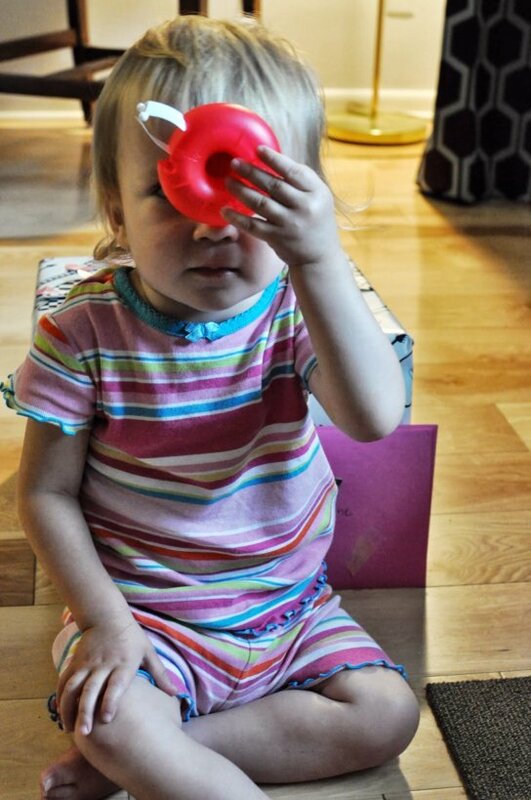 Take for example Scotch tape – the girl is much more dexterous with tape than I ever realized. These donut tape dispensers are excellent fun. 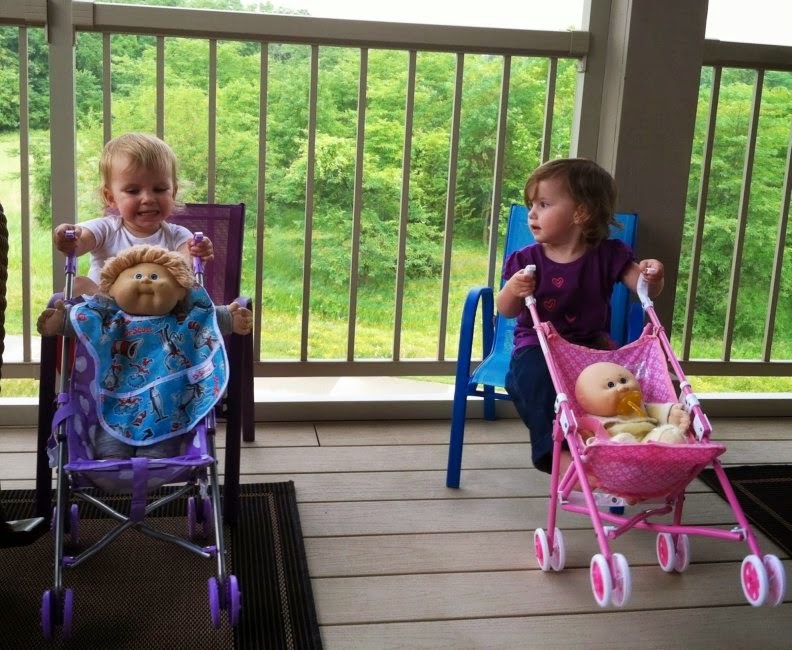 We had a fun time spending a rainy morning wrapping Aunt Caroline’s birthday gift. 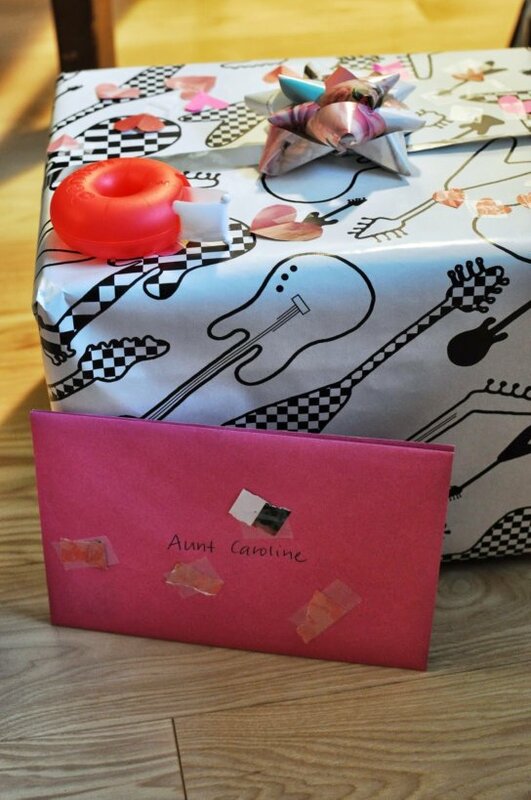 She added all the pieces of paper to the card and taped down the hearts to the wrapping paper. Next time I have to wrap a gift, it is all Greta. I truly am not a fan of wrapping gifts – so this job may be outsourced to Greta sooner rather than later. I did, however, have fun making a bow from magazine strips. This is one of those things I pinned off of Pinterest ages ago and am just now making use of it. Some things I just hate buying and would rather make or reuse – bows, wrapping paper, and cards are in that category. 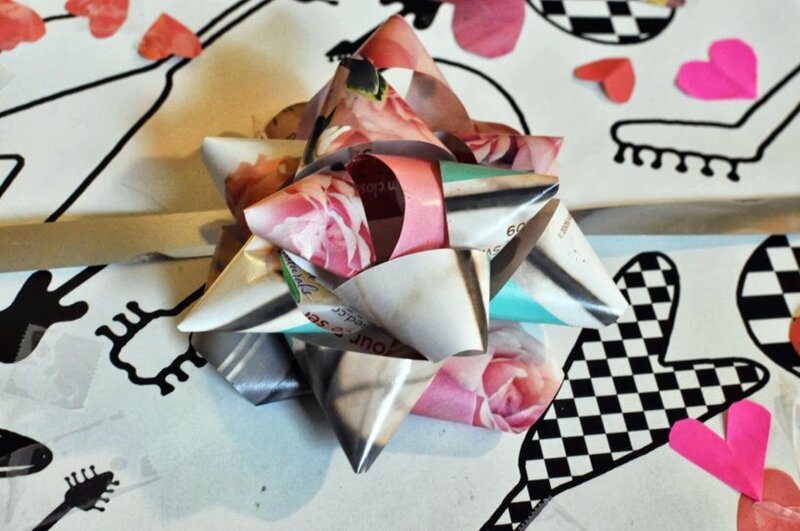 See this link for the how-to on making this bow. Cutting, and then sanding, sanding, sanding has been my other past time this week. We are working on a new computer desk so we can wrap up the office in our new house. 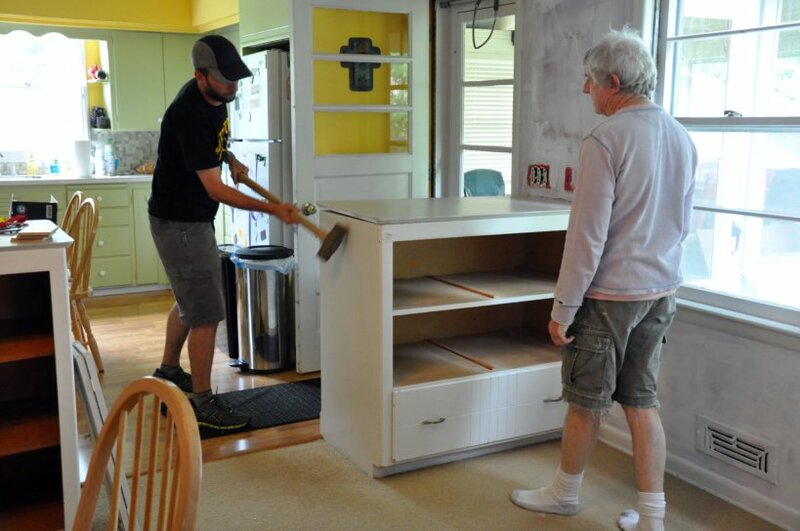 I am excited about this furniture project and cannot wait to show off the finished project! I hope to give you a tour soon, as many of our projects are winding down. In other news, I am itching to change the name of this blog – I just feel it has evolved and the name is a tad on the cutesy side. If you have any suggestions, I am all ears. Please leave a comment in the comment section below. 1. Slice and quarter 2 medium zucchini. Saute zucchini in 2 tablespoons olive oil over medium heat until both sides are slightly browned. 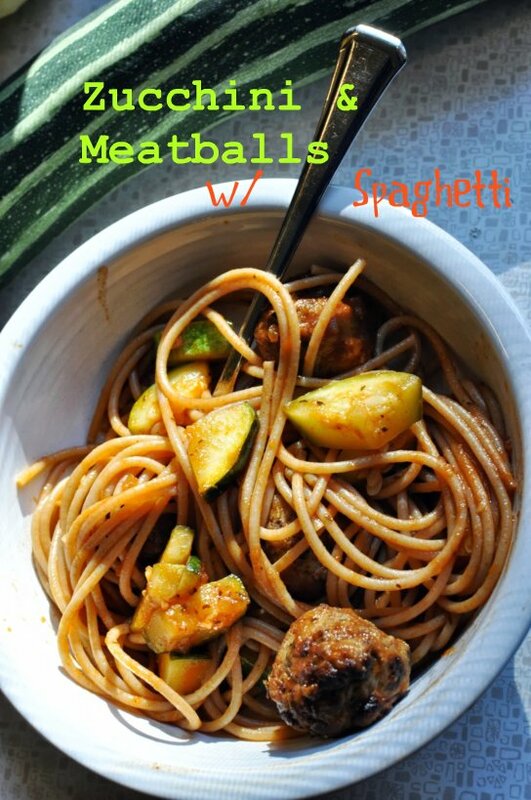 Add 8 – 10 oz of marinara sauce and meatballs of your choice. Simmer on low until thickened. 2. Cook 2 – 3 servings of spaghetti according to package. Reserve ¼ cup pasta water and then drain. Add water to marinara, stir well. Add chopped fresh herbs of choice such as, basil, oregano, and thyme. 3. Combine sauce and pasta. Serve immediately. This post brings you more ideas on how to use the zucchini from the gardens at this time of year, plus another peek at how our house is coming along. 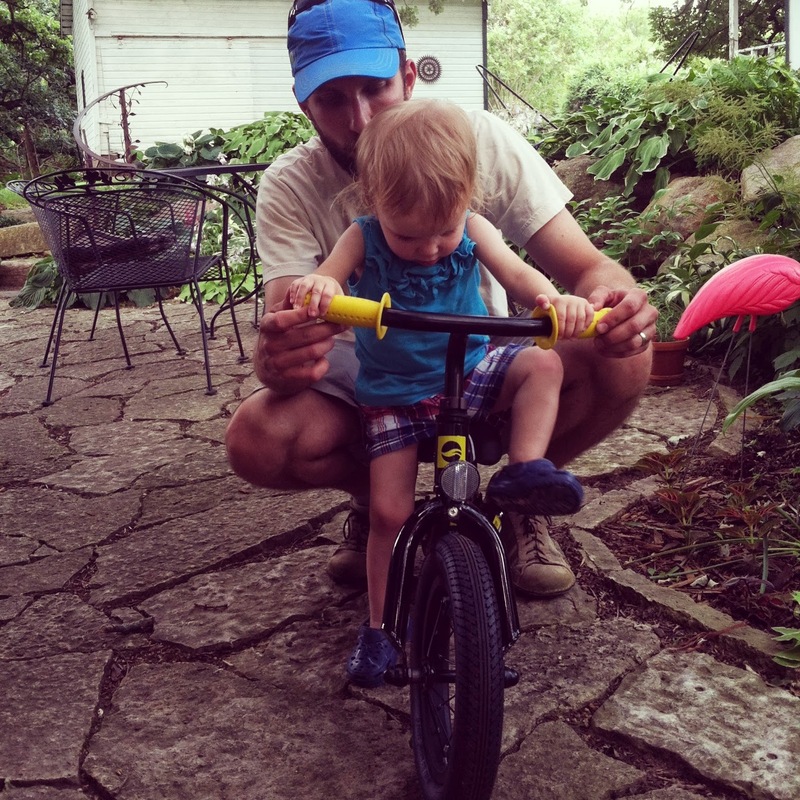 I have been on a long hiatus here lately, due to an overwhelming number of home projects. 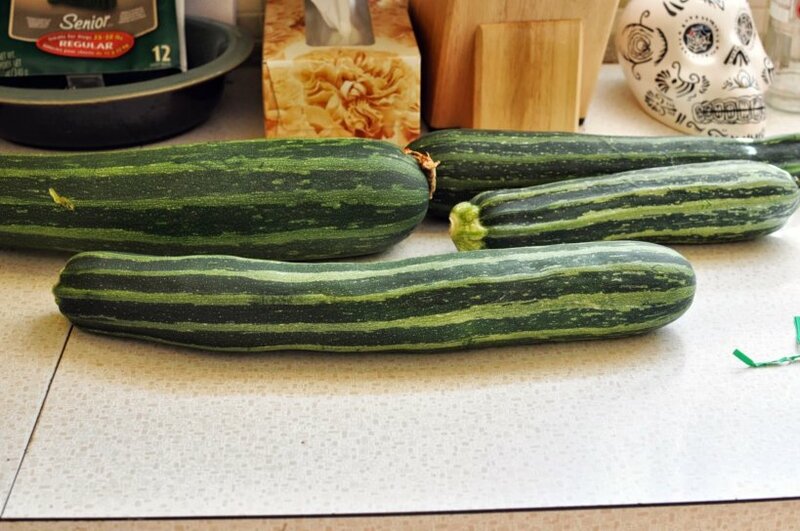 A few more of the monstrous zucchinis coming out of my mother’s garden! As I pondered what to eat after my ride on RAGBRAI, Eric suggested soup, which was actually quite brilliant. 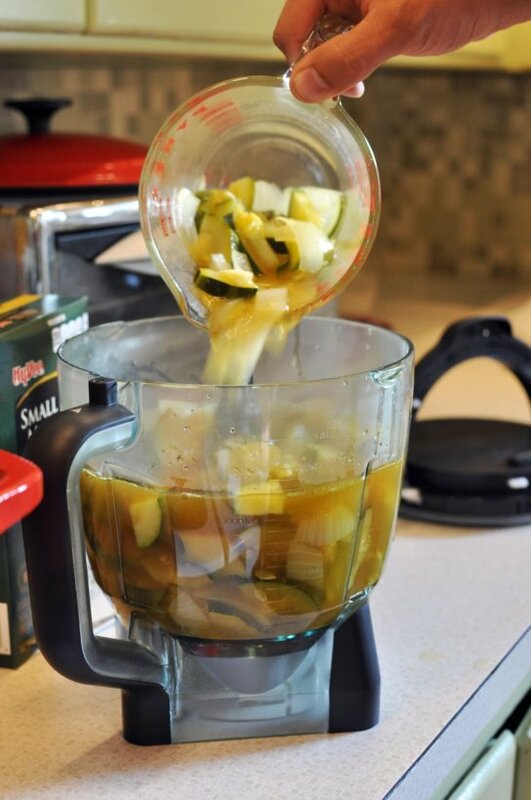 It was a great way to hydrate and use up a large amount of my zucchini in one recipe. First, I created a vegetable broth as my base. I am enjoying using my new gas burner range immensely. It is almost freaky fast in heat up time – must get used to that still. Then, I sliced my zucchini and quartered them. 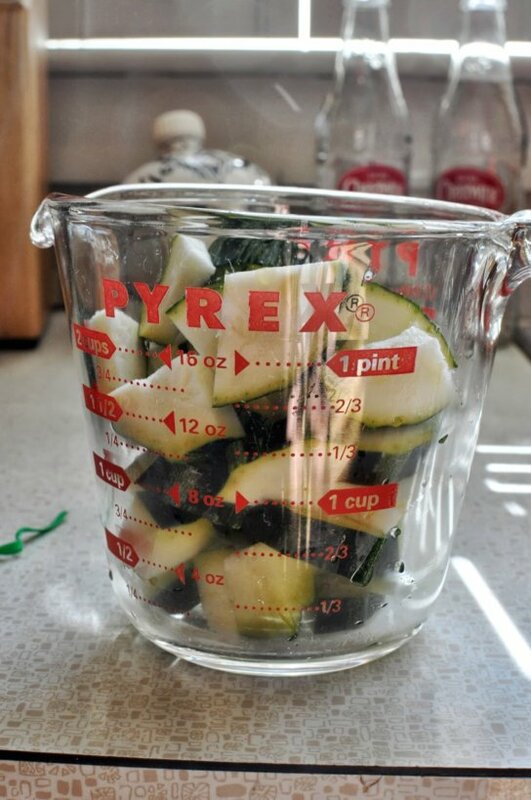 I ended up using 6 cups, which was just about 2 of my medium-large zucchini shown in the photograph. After simmering broth and veggies about 20 minutes, blend together. 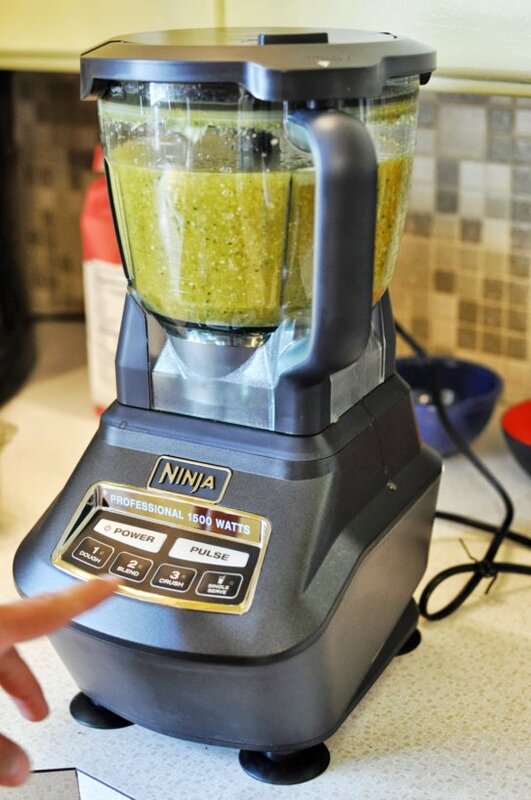 We have been loving our Ninja Professional blender – there is nothing it can’t blend, chop, puree, or smoothie! Plus, it has as much power at a fraction of the cost of some the the fancier blenders. OK, I admit, I was cheering when I read the consumer reports that put some of the cheaper blenders ahead of the uber fancy Vitamix. We found that this soup is equally good cold or hot – a perfect summer soup. 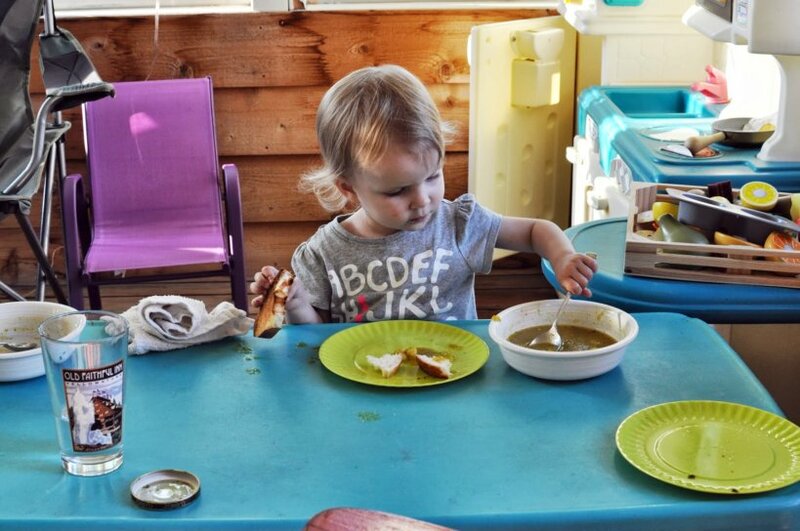 Greta enjoyed eating her soup and making a mess of it. 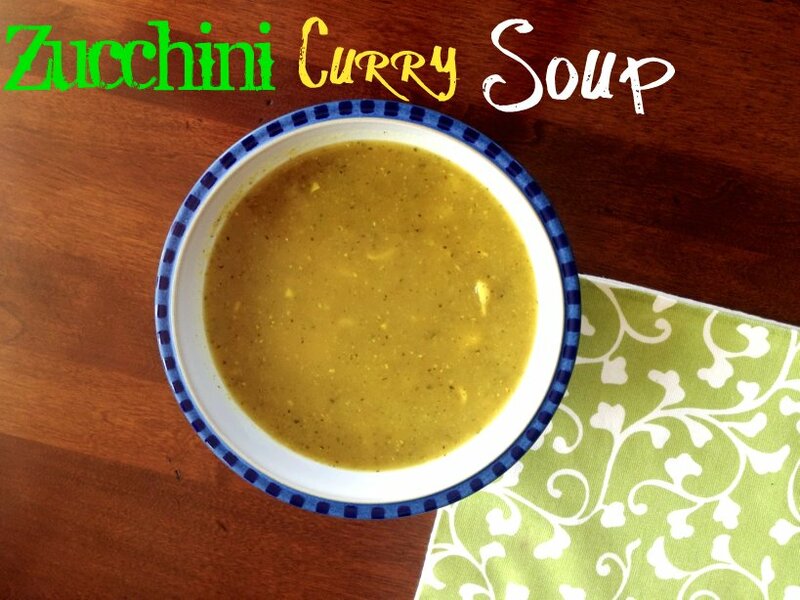 Be warned – the curry in this soup will stain! 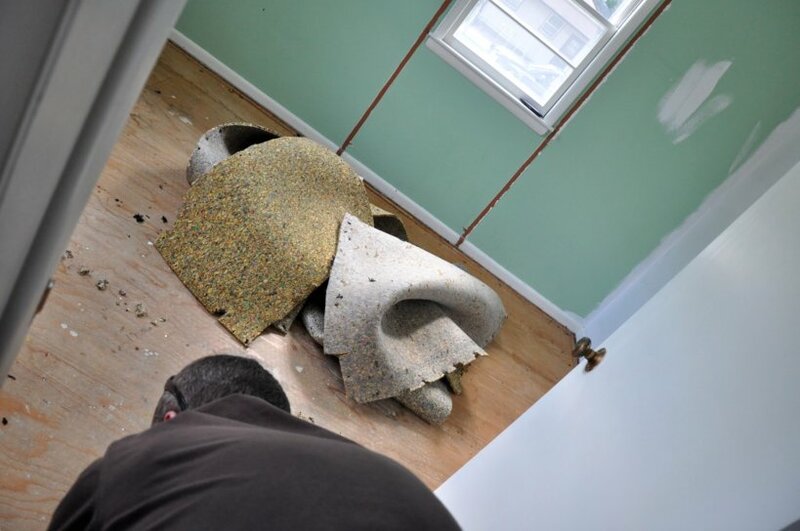 Now, onto the floors. 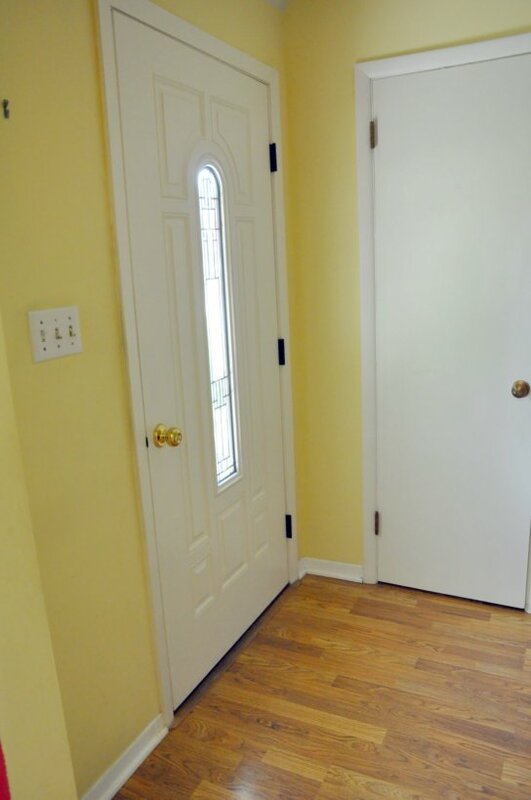 When we bought the house, the entryway, downstairs hallway, and kitchen were all covered in laminate flooring. 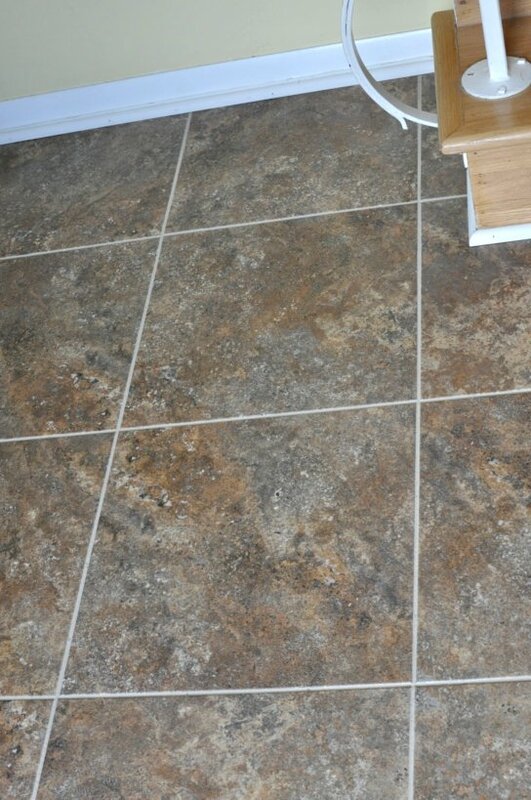 Honestly, it looked nice, but we realized that tile was what we wanted. We opted for a slate look-alike and decided to put this down in the entryway, inside the coat closet, the downstairs bathroom, in the broom closet, and to the top of the basement stairs. This way, snowy boots could go straight to the closet or basement without depositing dirt and salt onto the wood floors. One of the most beautiful aspects of the house are its new hickory floors. 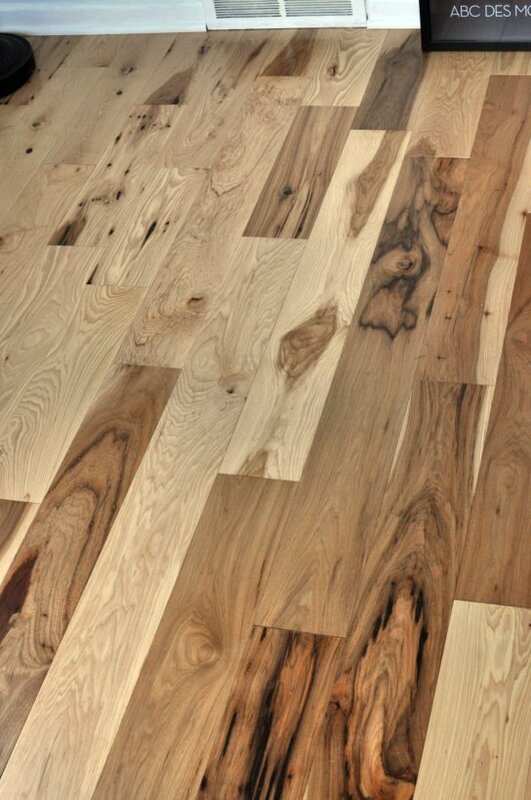 Eric picked out the hickory due to its beautiful variation in grain, coloring, and character. I am thrilled that the carpeting is now gone and we can now gaze at these boards instead. 1. 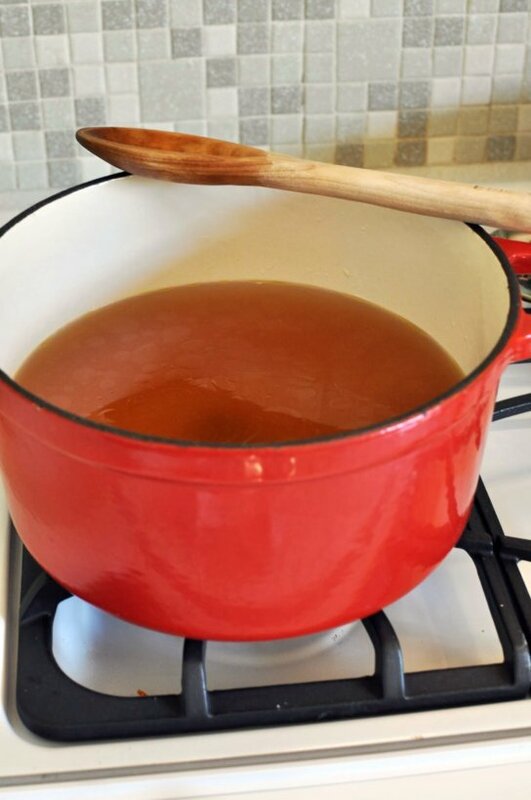 In a large stock pot, boil 6 cups vegetable broth (or water plus bouillon) with 1 teaspoon salt. 2. In a large skillet, heat 2 – 3 tablespoons olive oil. Saute 1 diced yellow onion until soft. Add 3 cloves of diced garlic and cook about 5 more minutes. 3. Add to the boiling broth, 6 cups sliced and quartered zucchini. Add onion and garlic mixture and 2 tablespoons curry to broth. Bring to boil and then reduce and simmer on low for 15 to 20 minutes or until zucchinis are softened. 4. Blend entire mixture with immersion blender or upright blender, taking care not to burn oneself! Use a towel over the top of your blender if it is not a tight, locking lid. 5. Return to stockpot and add in 1-½ cups small pasta shells. Cook according to package. Serve hot or cold. 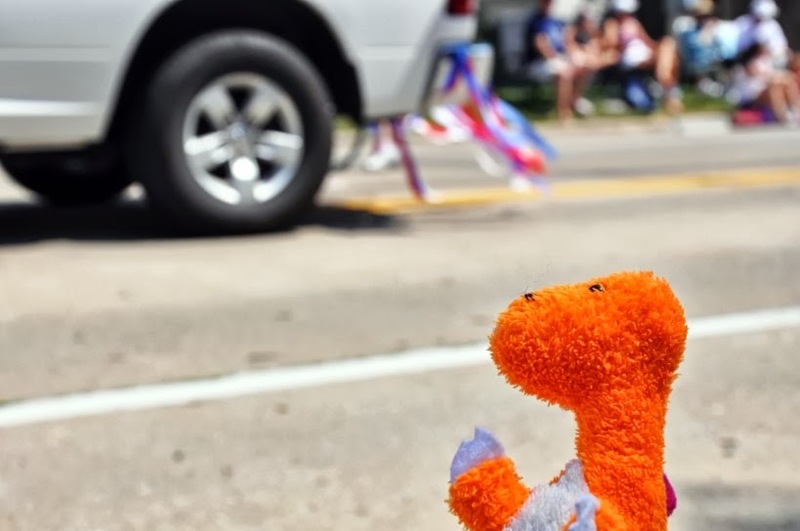 Summer in Iowa means a lot of things – one thing is RAGBRAI – Register’s Annual Bike Ride Across Iowa. 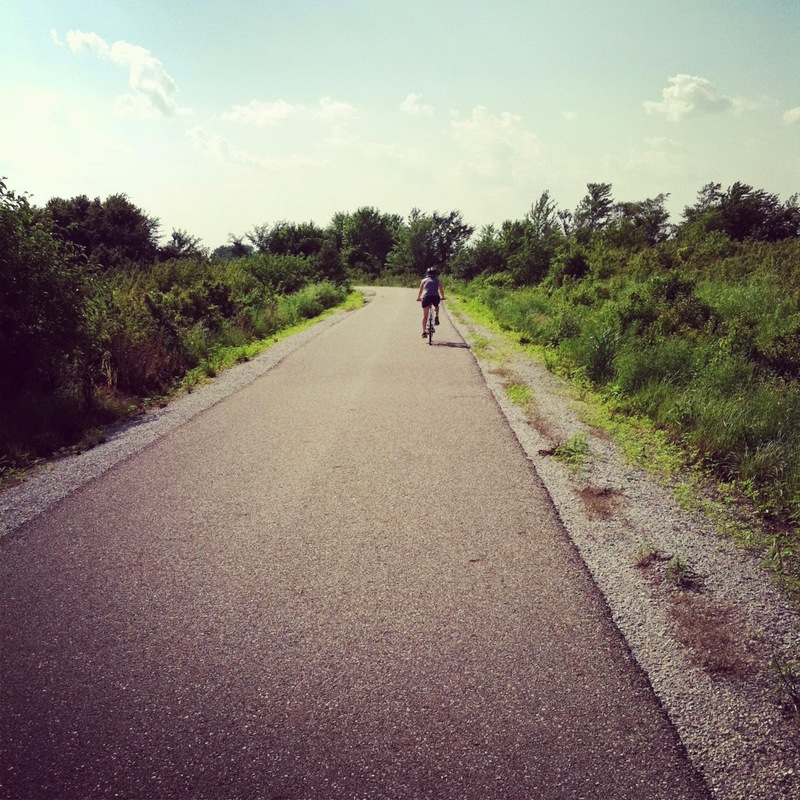 We decided to ride the leg from Perry to Des Moines last Tuesday. This is a beautiful way to see rural Iowa. 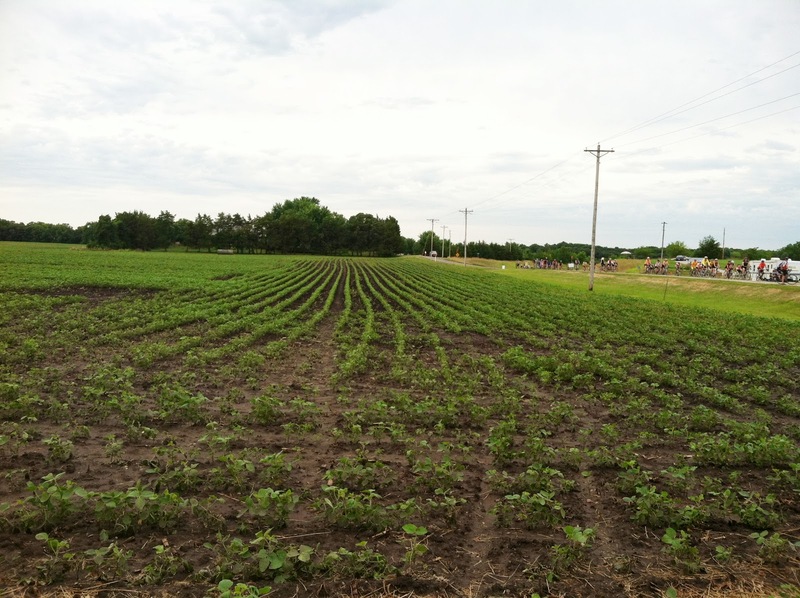 This was a peach pocket pie stop in the midst of a soybean field. 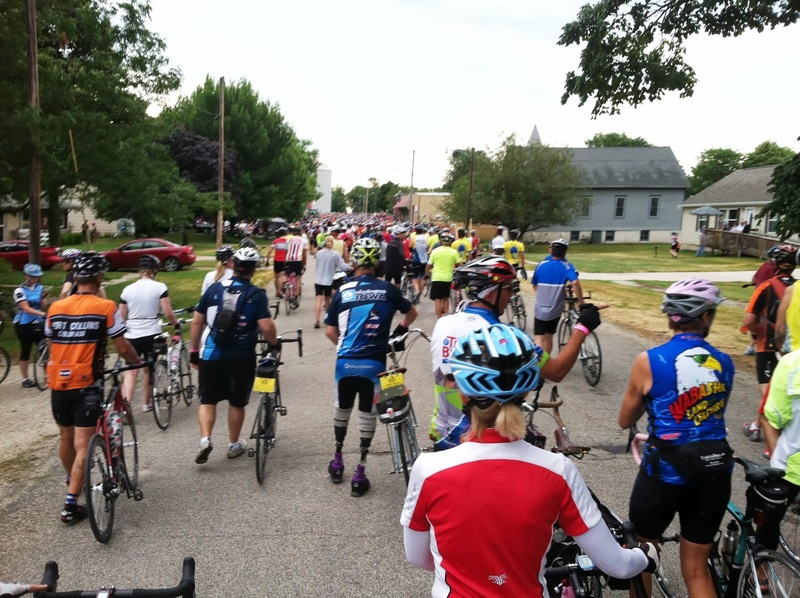 Some of towns we rode through were so congested with riders, we actually got off and walked. 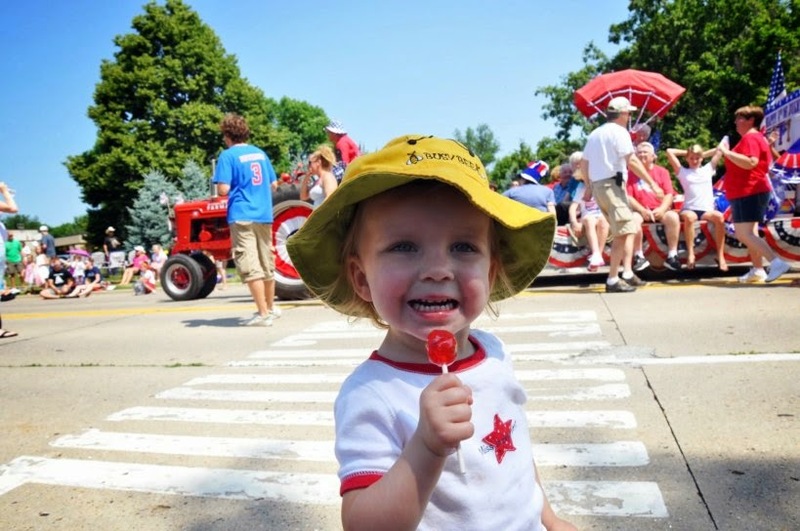 RAGBRAI is no race, it is a circus on wheels with free watermelon stands, turkey legs, pancakes & pies, and beers and drinks. 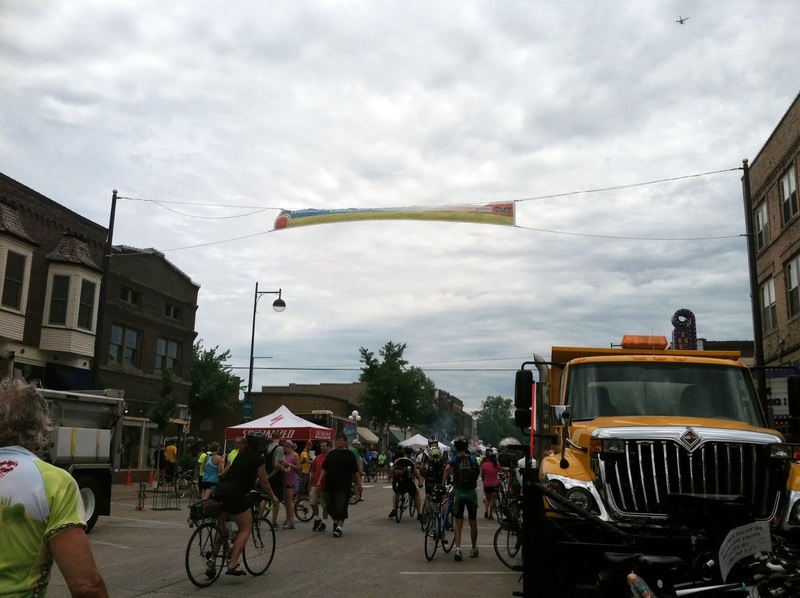 Van Meter proved to be one of the more lively stops with their Raccoon Juice – a vodka infused lemonade drink. We were encouraged to try this invention by a local police officer who said it was the winner of a city-wide contest. 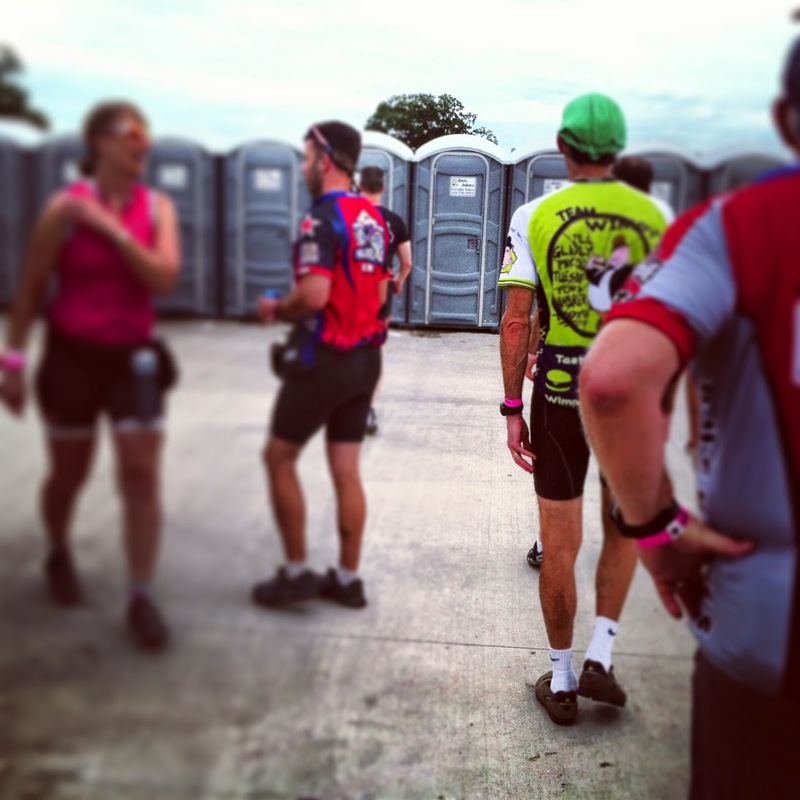 Waiting in lines is an unfortunate part of RAGBRAI, but true to all Iowa events, the people were polite, friendly, and interesting to converse with. 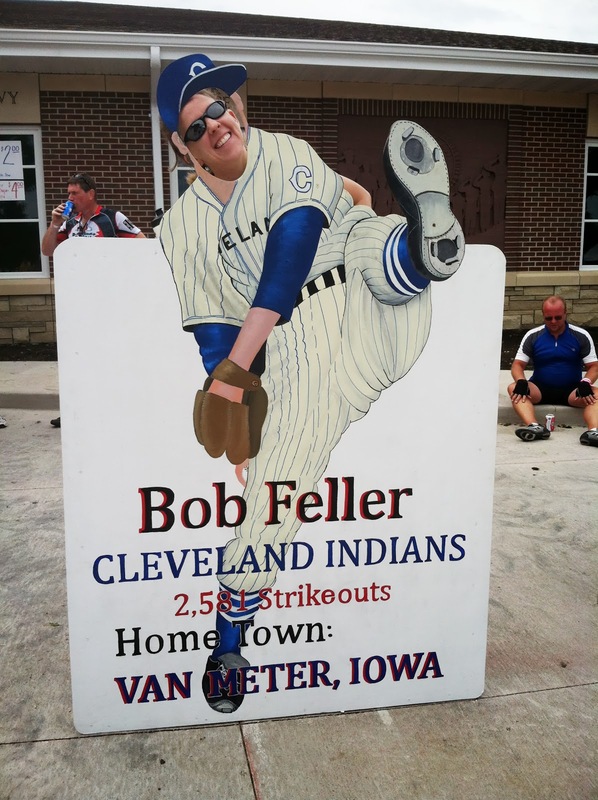 The leg for Tuesday, ended at Valley Junction – a quaint little strip in West Des Moines full of antique shops, cafes, and art galleries. 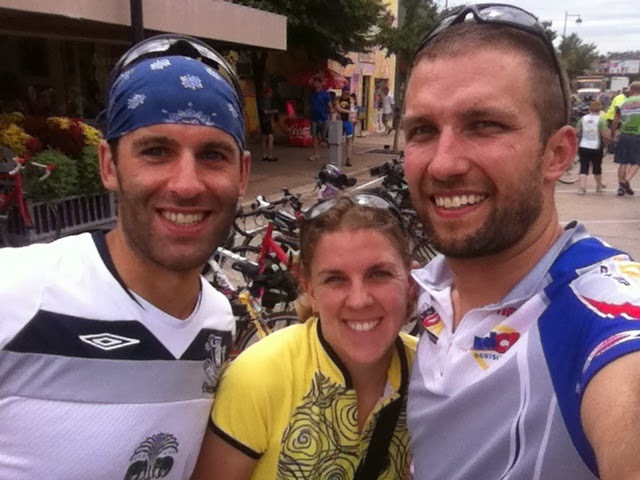 After 50 some miles, pies, muffins, beer, Raccoon Juice, bananas, energy bars, espresso shots, hills, fields, sweat, and fun we were still all smiles. We spent the rest of the afternoon recovering and then hosting a RAGBRAI team for the night, before they continued on to finish the rest of the ride. 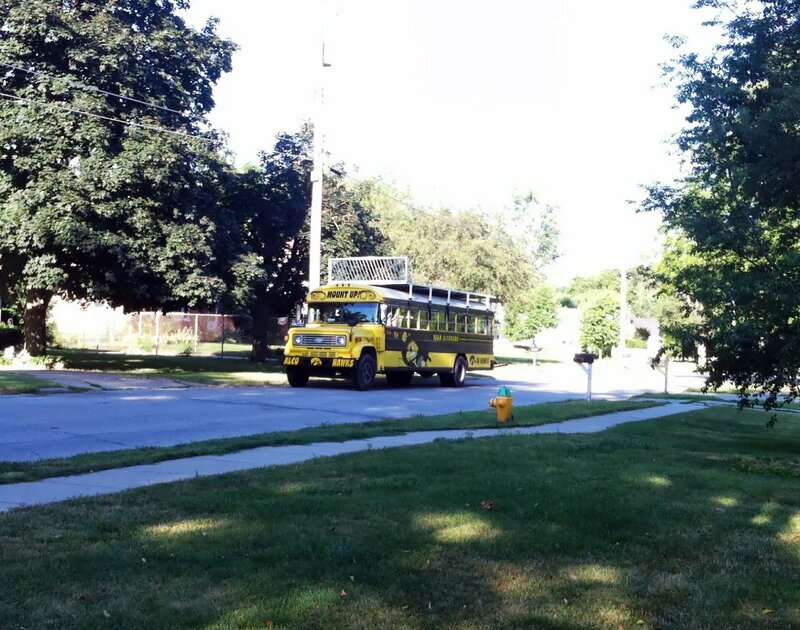 Maybe in the near future we will have our own team and team bus. 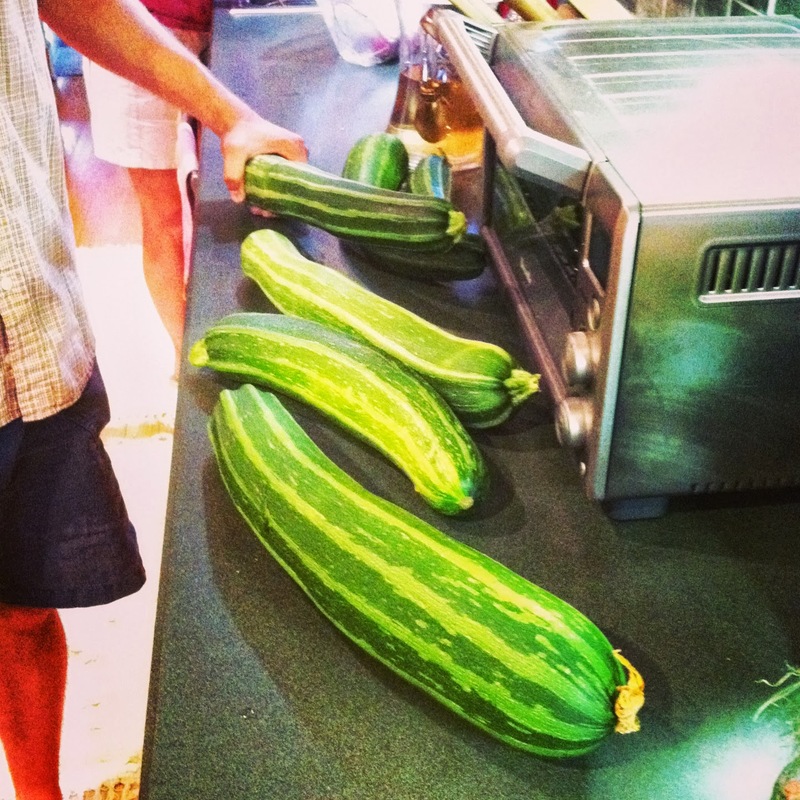 It’s also zucchini time! My mother’s garden is exploding with these huge bad boys and so of course she is (unloading is more like it, via one of the best comics ever) giving them away to us. As is always the case, this is only a fraction of the haul. Rather than turn to the tried and true zucchini bread, we decided to try a few new things this year. 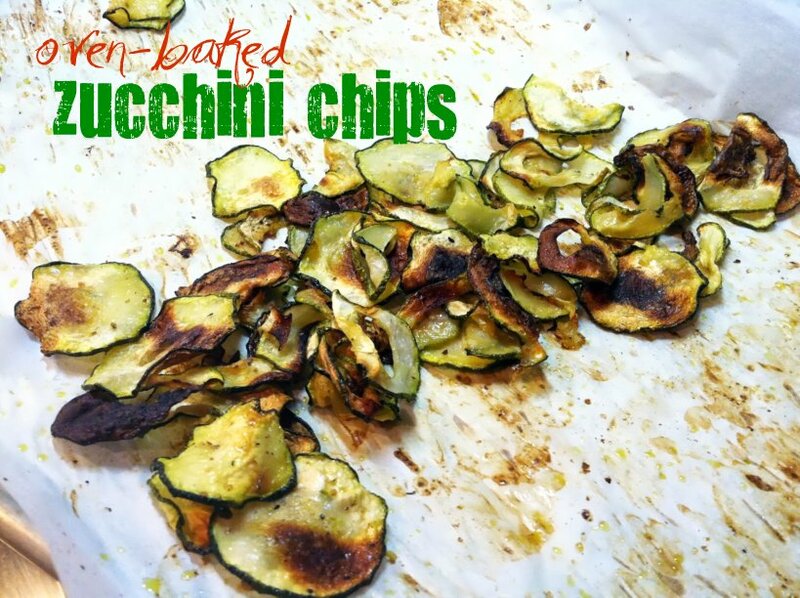 First up, oven baked zucchini chips. These are super easy, especially if you use your handy dandy mandoline. Slice them thin, toss in olive oil, sprinkle with seasonings and then bake on parchment lined baking sheets at 325 til dried and crispy – it’s that easy! We tried garlic salt. This pan was over-loaded and needed to be only one layer thick for optimal crispy chips. Bake until crispy and golden. I personally love the darker, slightly burned chips, but watch the oven closely to prevent over cooking. 1. Preheat oven to 325 degrees. 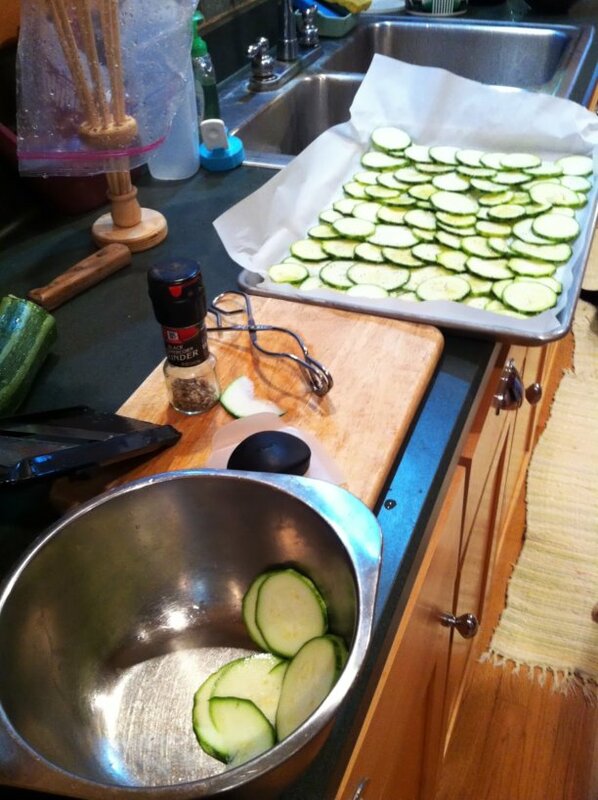 Slice 3 medium zucchini into 1/8″ slices. 2. Toss slices in 2 tablespoons of olive oil and desired seasonings. 3. 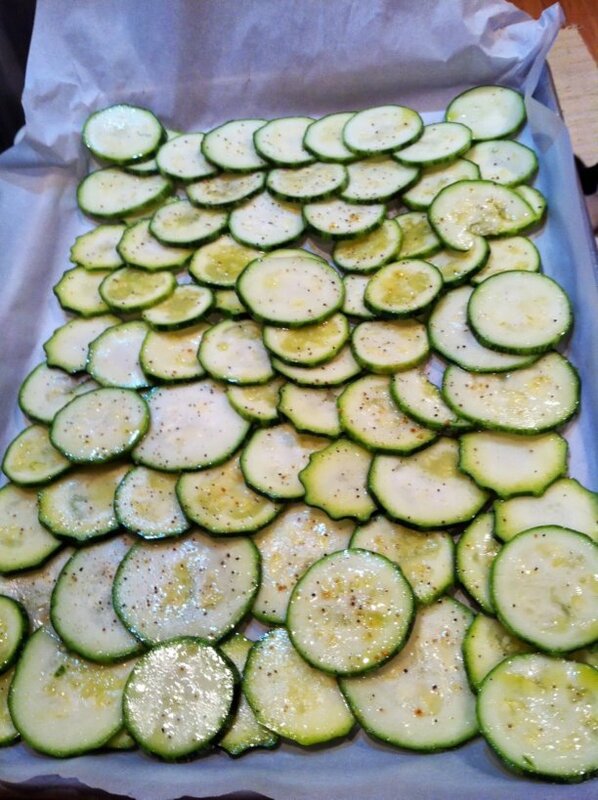 Lay slices on parchment lined baking sheets in a single layer. Bake 30 minutes, flip to other side, bake 30 more minutes. 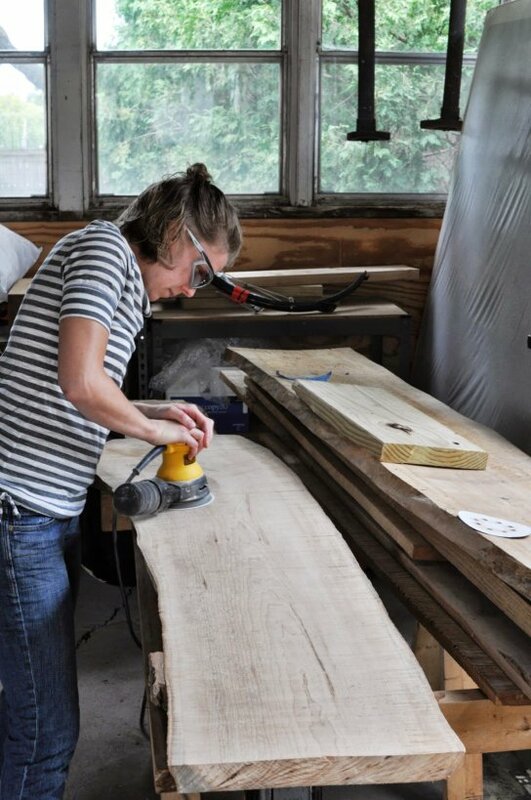 Add or remove time as needed, depending on thickness of slices. Watch for over browning. Serve immediately. Last weekend my baby turned 2! I can hardly believe how quickly time has flown – I know it will only continue to move faster. We started off the birthday weekend with some fishing. 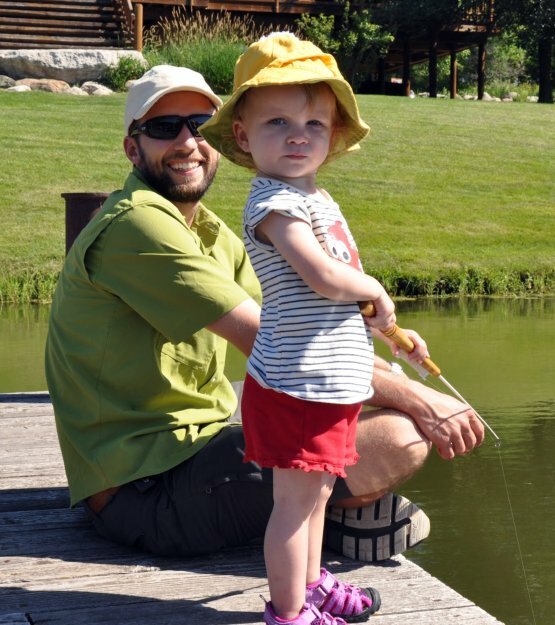 We discovered that Greta really enjoys fishing – except when the big fish comes out of the water, then we only want to run off of the dock. Greta is lucky enough to share her birthday weekend with her Grandpa, holding her in this photo. 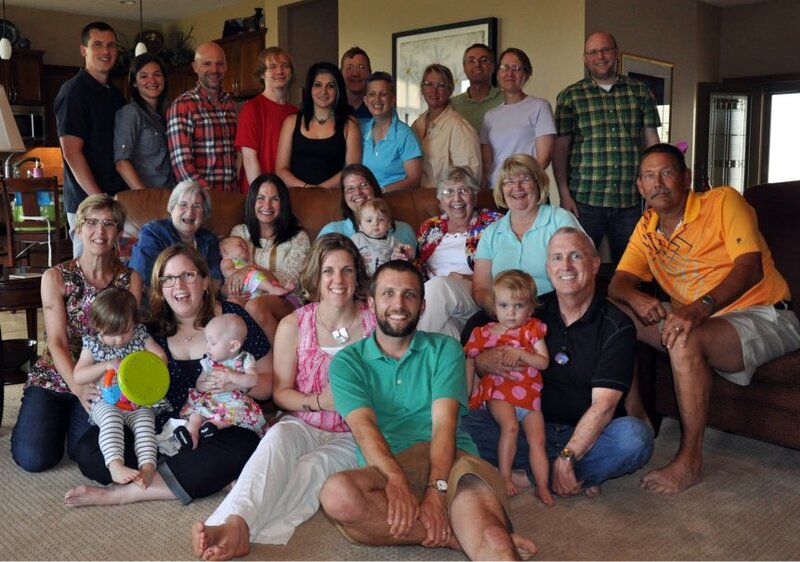 We celebrated with my father in law and extended family on Saturday. This meant a dinner of sushi from the fantastic Miyabi 9 in the East Village of Des Moines. 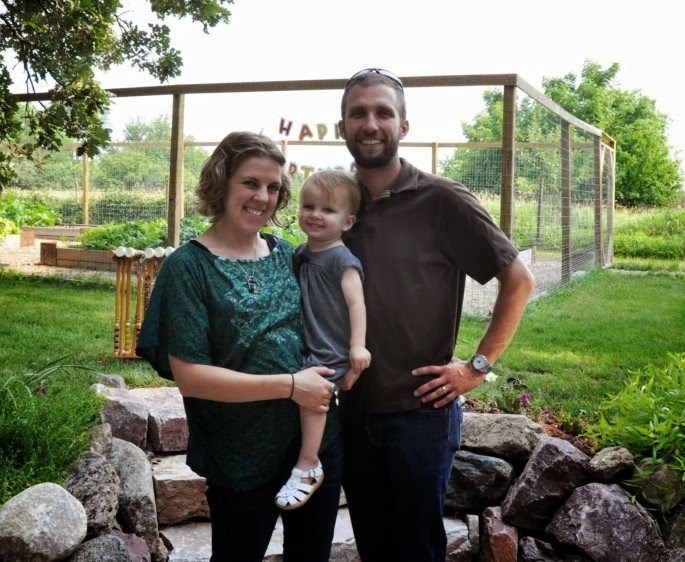 Des Moines has some fantastic places to dine – I feel like I am getting to know my hometown all over again – everything is so different in the eight, more like twelve years since I last lived in town. 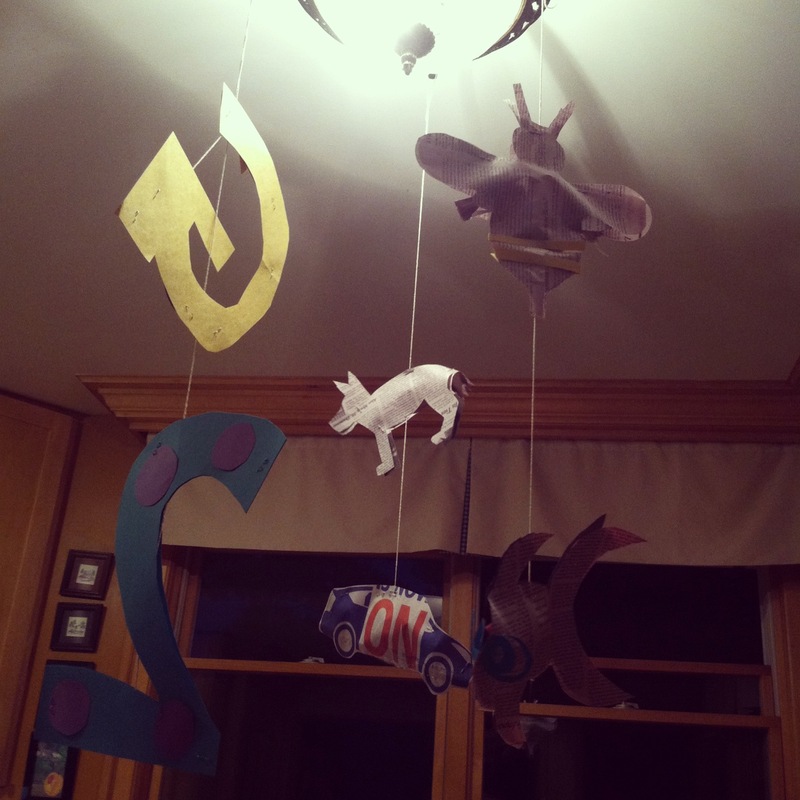 Sunday morning, Greta awoke to find this mobile hanging from the kitchen light at my parents’ house. I hastily made it the night before so she would see her favorite things in the morning. The dog, bee, fish, and car are all made from newspaper and stuffed to appear more 3D. The G and 2 are made from colored construction paper. 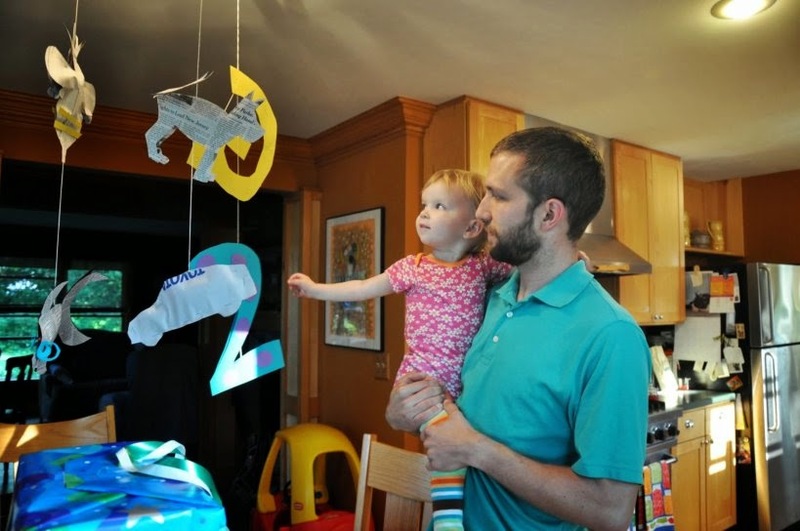 Just as I suspected, she loved this mobile and spend a few moments going over each and every item. I mixed up the dry and wet portions of the pancakes the night before, so all I had to do in the morning was allow them to warm up slightly before combining them and cooking. If you plan ahead, there is no need for tasteless pancake mixes. 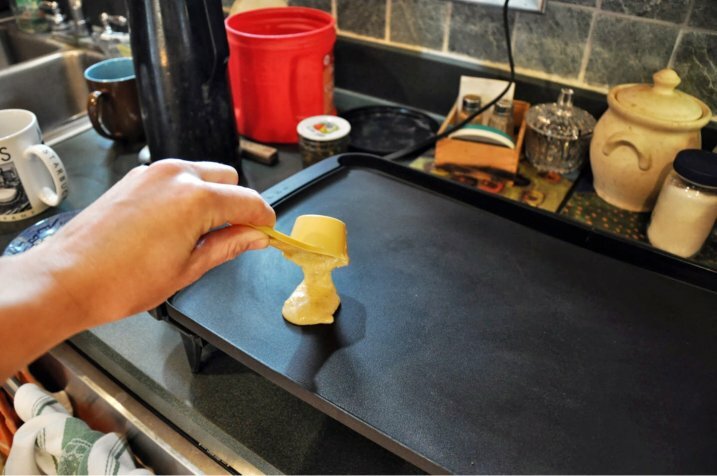 I like to use 1/8 cup measuring cups to make my pancakes, this way they are more manageable for small hands. Eric got to work on some more of those tart cherries. It is quite the bumper crop year! 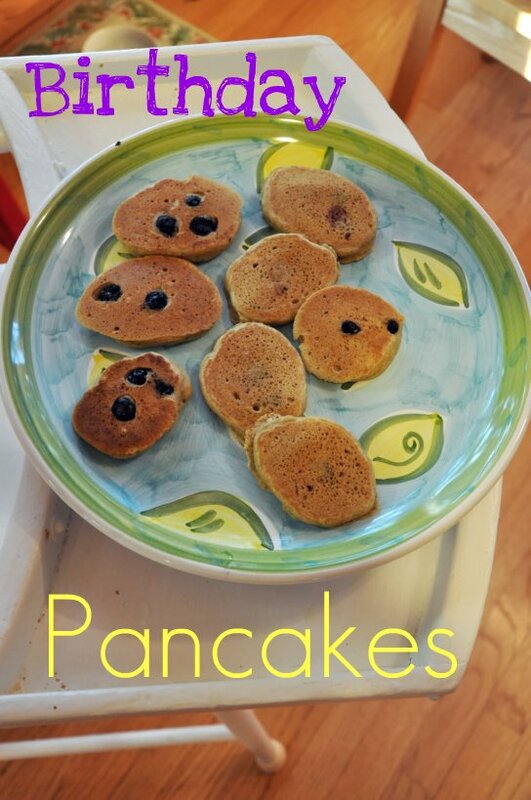 We added tart cherries for the adult pancakes and blueberries for Greta’s pancakes. 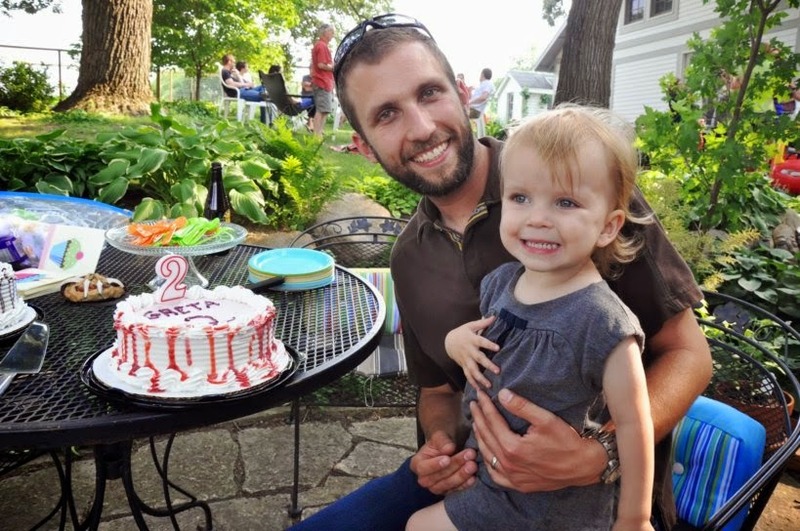 Her party was a hit – we had it outside at my parents’ house. Greta was all smiles the entire evening. As always, she was spoiled rotten. 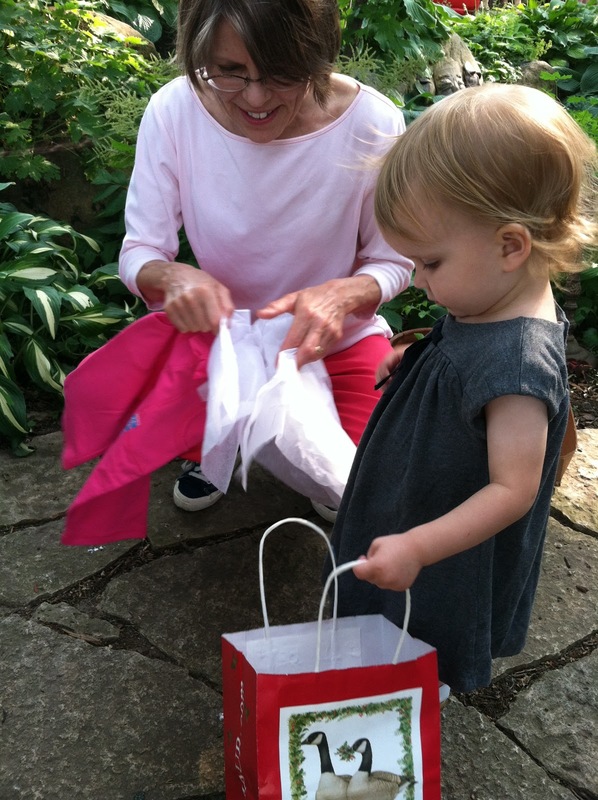 Her Great Grandma got her some pink pants and her Momo (what she calls my mom) helped her open them. The ice cream cakes from Dairy Queen were exceptionally good – I personally loved the chocolate peanut butter pretzel one (good choice, Eric). By the way, this is Greta’s cheese face when the camera comes out. 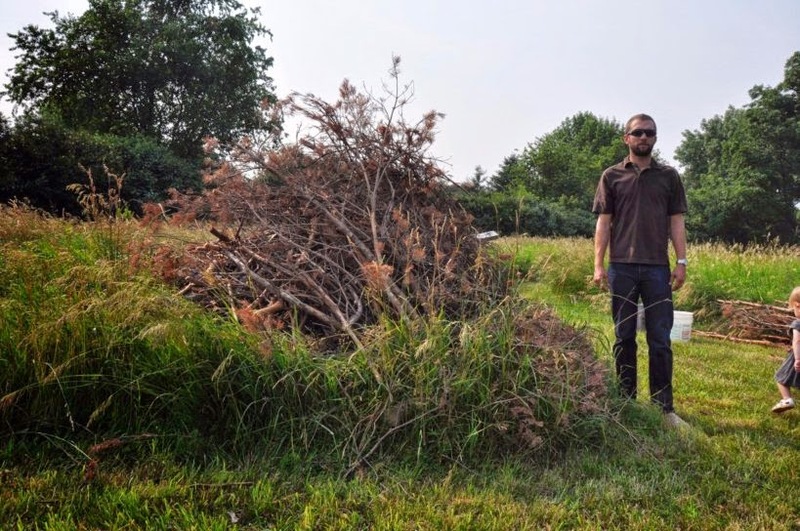 There may or may not have been a large pile of brush. It may or may not have burned. All in all, it was a lovely June. 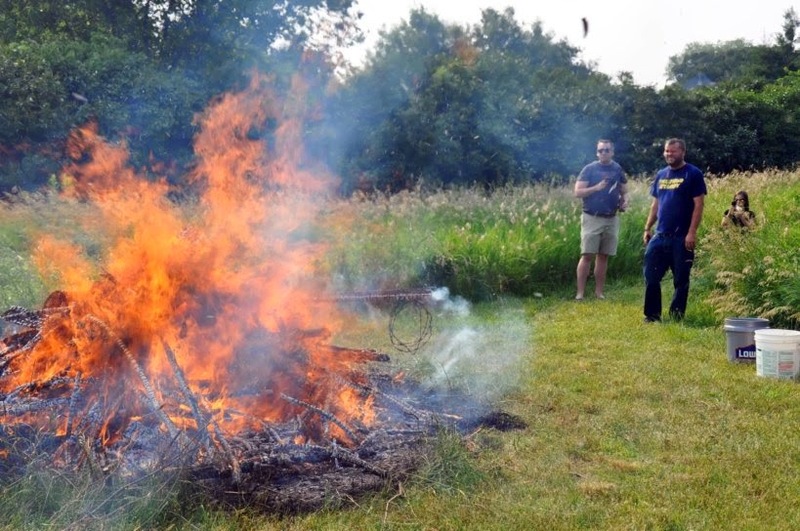 Until next June, save your Christmas trees. 1. In a bowl combine 1 cup all-purpose flour, 1/2 cup cornmeal, 1/2 cup barley flour, 2 teaspoons baking powder, 1 teaspoon baking soda, 1/4 teaspoons salt, and 1/2 teaspoon ground cinnamon. 2. In a small bowl whisk together: 2 eggs, 2 cups buttermilk (or milk or milk alternative + 2 tablespoons lemon juice), and 4 tablespoons cooking oil. 3. 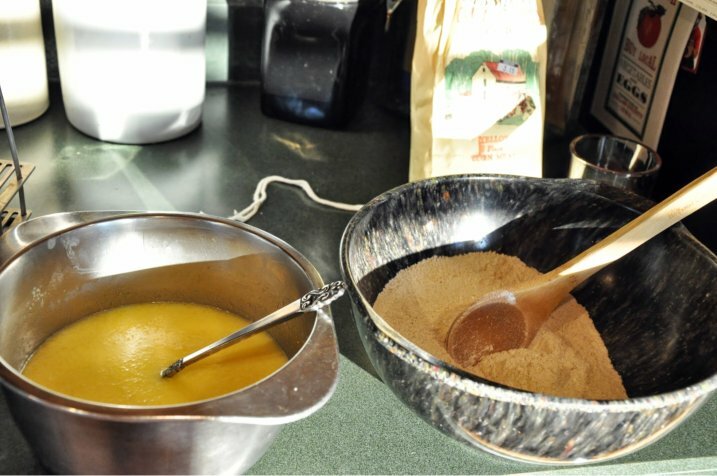 Make a well in the center of the dry ingredients and add egg mixture all at once. Stir quickly, just until all ingredients are mixed. Batter will be lumpy. 4. 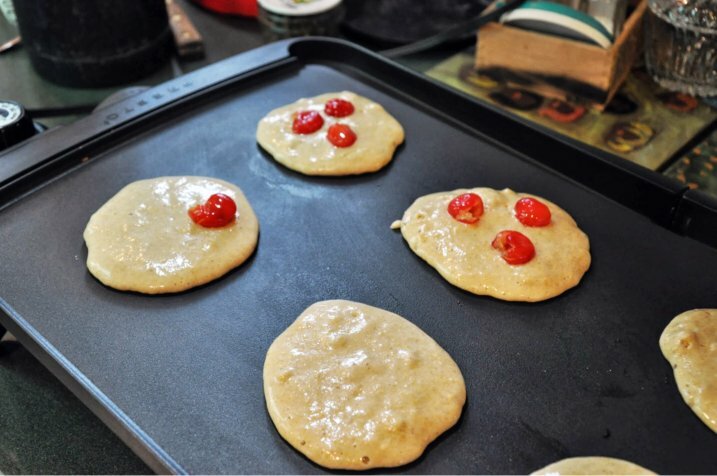 Pour 1/8 – 1/4 batter onto pre-heated griddle. 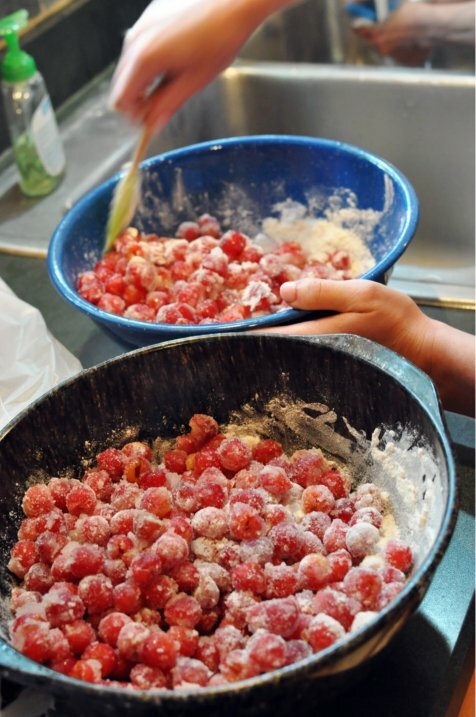 Drop fresh blueberries or tart cherries into batter. Cook 2-4 minutes per side, flipping when edges are slightly dried and center is bubbly. Cook 2-4 more minutes on other side. Serve warm with topping of your choice. One of the things I love about being at my parents’ house are the gardens and fruit orchards. Each year is a little different too, depending on what it is a good year for. 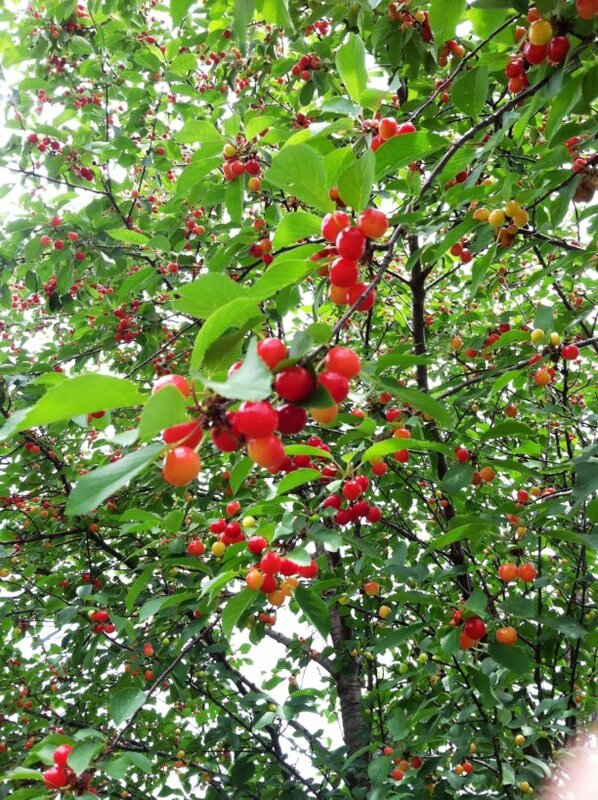 The summer of 2013 is a cherry year for sure. 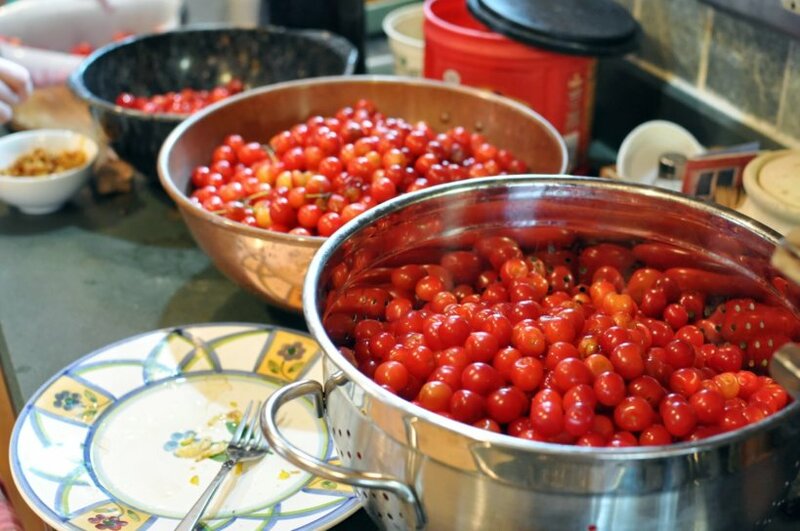 This is only a fraction of the cherries that have been picked this season. True to our family, the cherry prep last weekend became a family production. 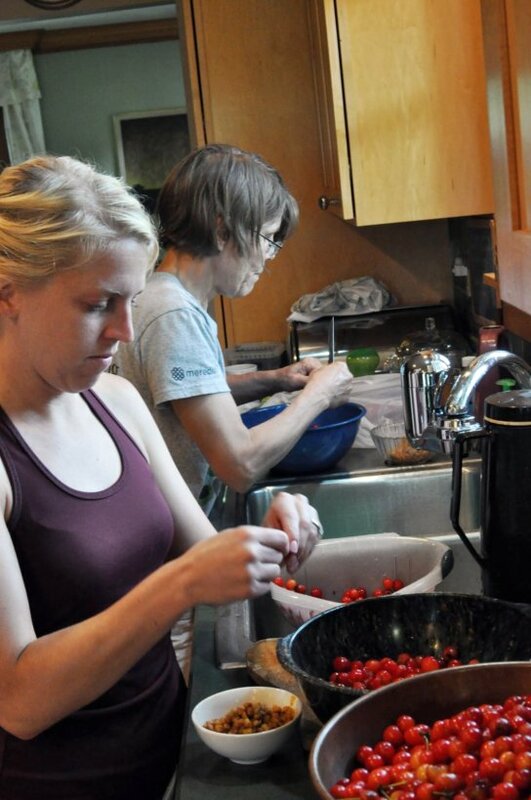 My mom and sister pitted bowls upon bowls of cherries. 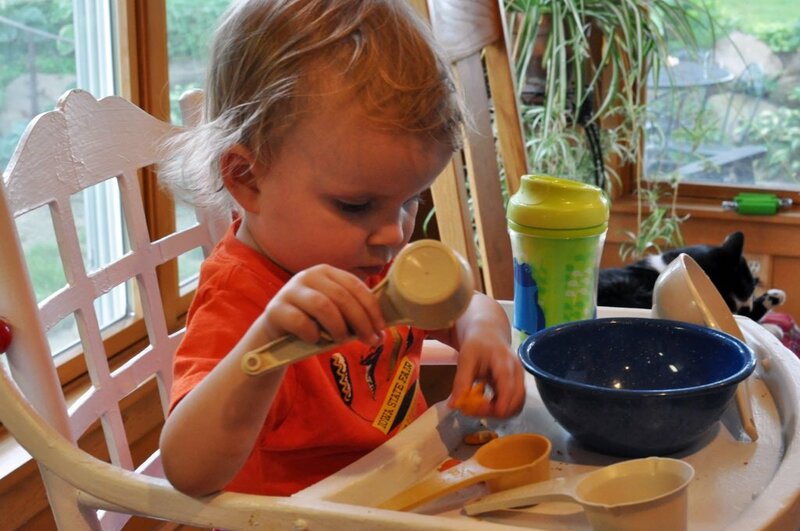 Greta played with her measuring cups and goldfish crackers while I prepared pie crusts. I think I have a budding chef or baker on my hands. 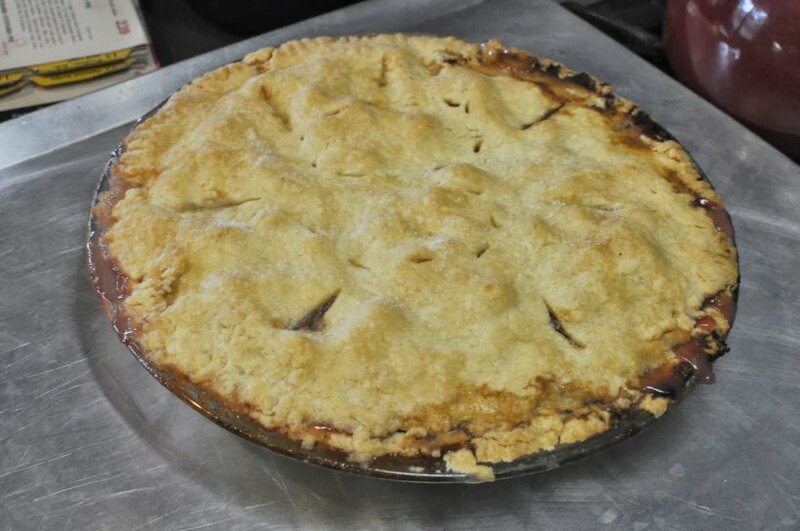 Usually, I use my own tried and true pie crust recipe. However, since I was under the tutelage of my father, I decided to go ahead and try his recipe. 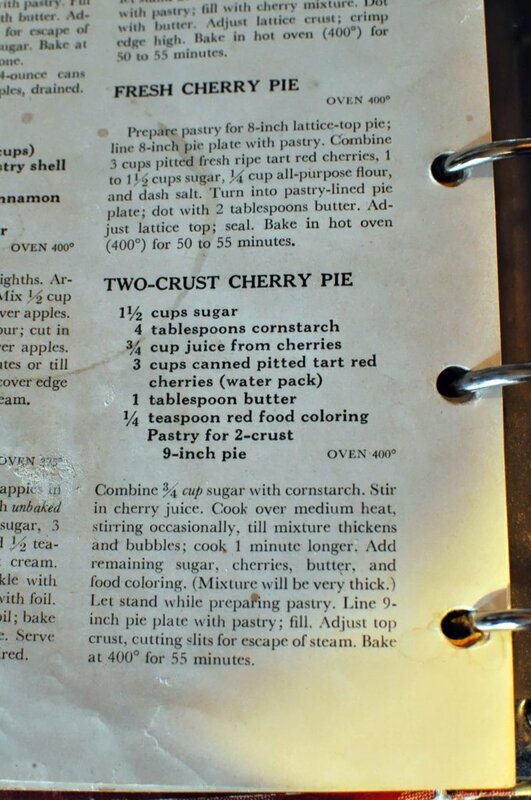 I started flipping around the plethora of cookbooks and magazines and had a hard time finding a simple cherry pie. So many of the recipes called for so many additives. I almost overlooked the easiest pie, Fresh Cherry Pie. The crusts got a little on the warm side, which makes them difficult to roll out and transfer smoothly. 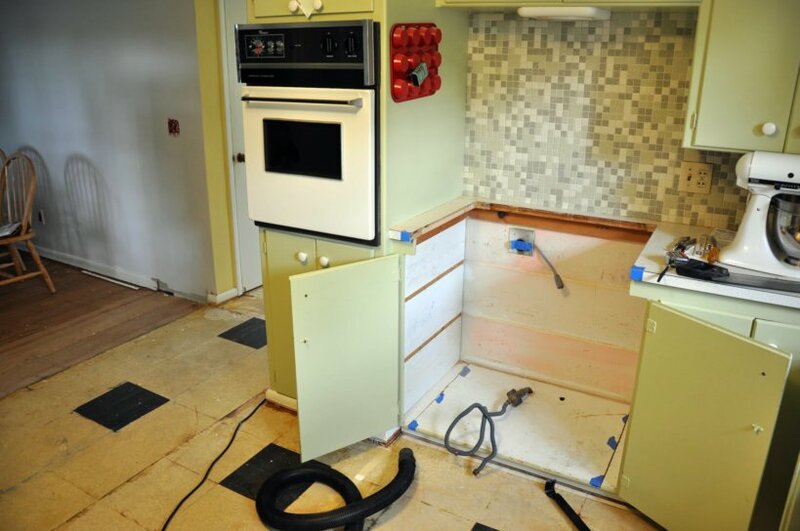 A cold marble or stainless steel rolling pin and a cold work surface makes this easier. Caroline got to work on the fillings for not one, but two cherry pies. 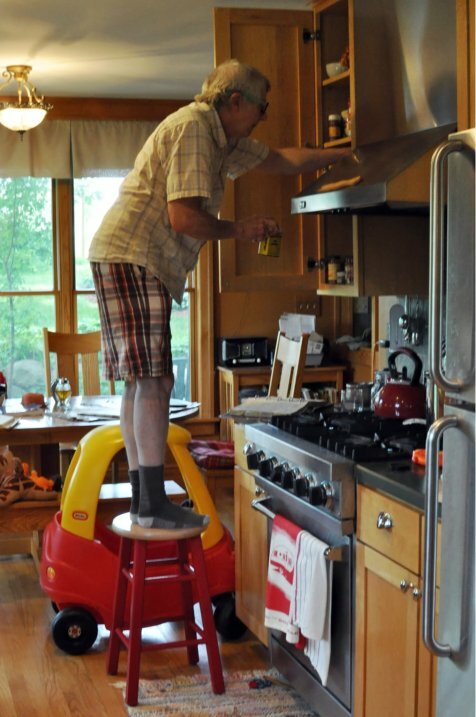 Meanwhile, dad hunted for seasonings. We debated adding a teaspoon of almond extract, but ultimately decided to be purists. The filling turns into a sugary thick mass when allowed to sit for a bit. 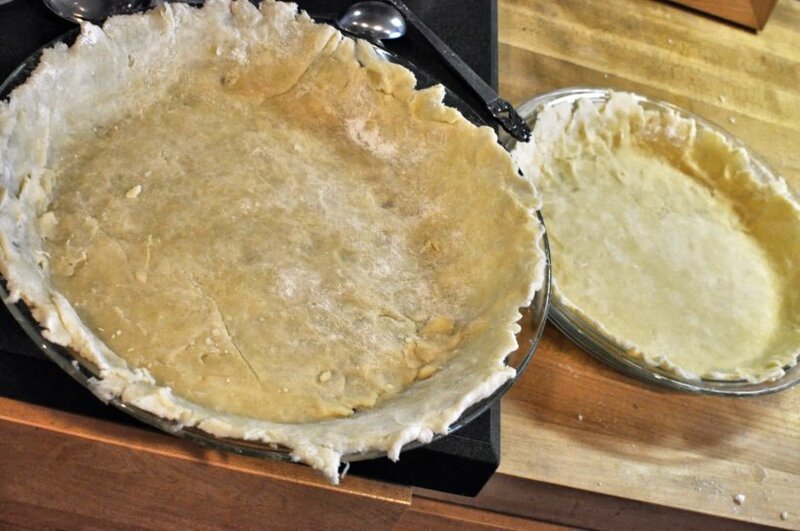 One pie is sealed up and ready to bake while the other awaits its top. Post baking perfection. One pie went home with my sister and her husband, one to my father-in-law for his birthday, and two to be eaten with afternoon coffee and breakfast. My family is well known for enjoying pie at any time of the day. A fresh pie is always better, so why not enjoy them for breakfast? 1. Preheat oven to 400. 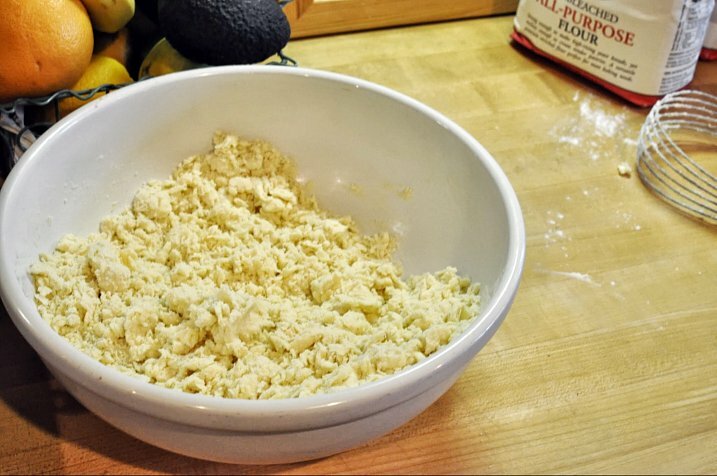 In a medium mixing bowl, use a pastry blender to cut in cold butter until pieces are coarse crumb size. 6. Optional: brush dough with milk and sprinkle with cinnamon and sugar. Cover edges in foil. Place piece of foil on bottom rack of oven. 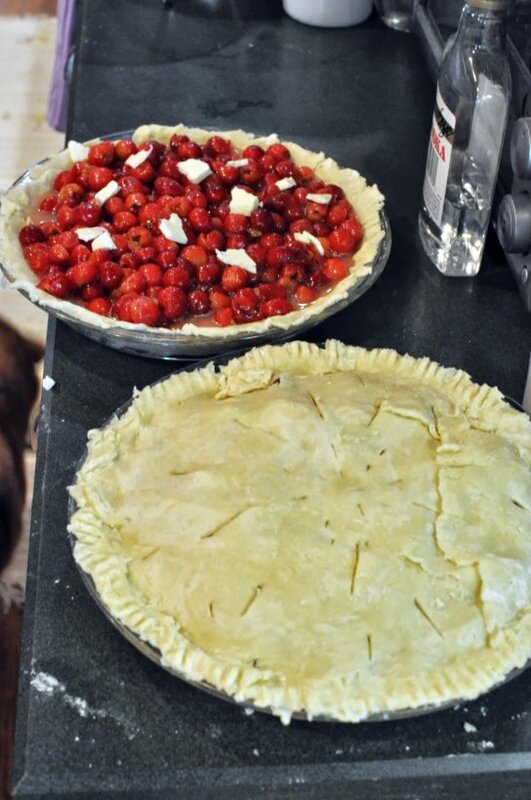 Place pie in preheated oven, on middle shelf. Bake for 20 minutes at 400. Reduce oven to 350, remove foil, and bake another 40-50 minutes longer or til crust is golden and filling is bubbling. 1. 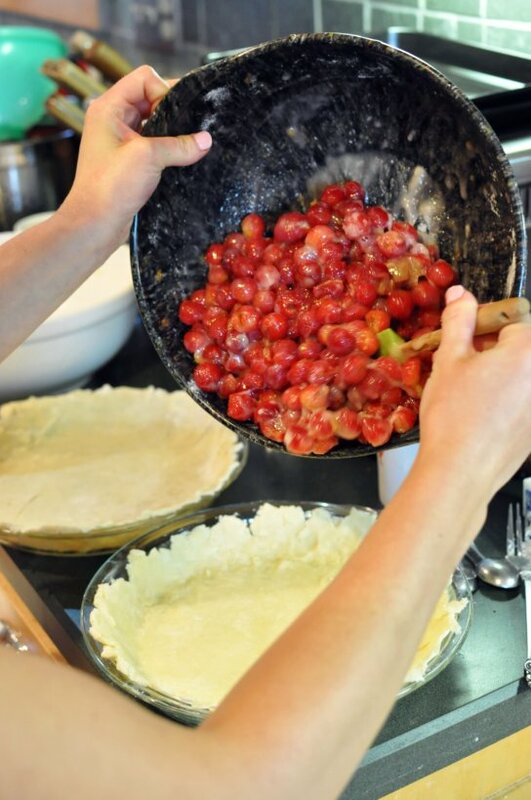 In a large bowl: combine 3 cups pitted, fresh ripe red tart cherries, 1 to 1-1/2 cups sugar, 1/4 cup all-purpose flour, and dash of salt. Turn into prepared pie pan. Dot with 2 tablespoons of butter. Seal top of pie with second half of pie dough. Bake 50 to 55 minutes in a 400 degree oven. 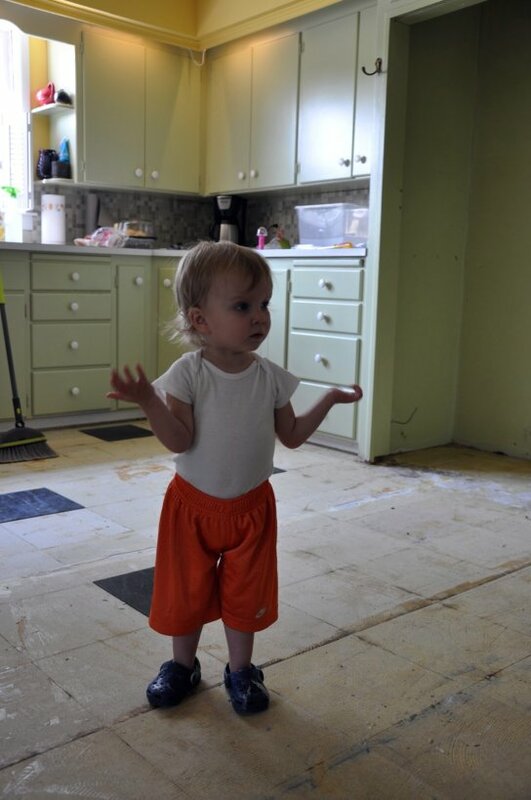 We have been feverishly working on the house the past couple weeks. I am happy to show you the first completed room. 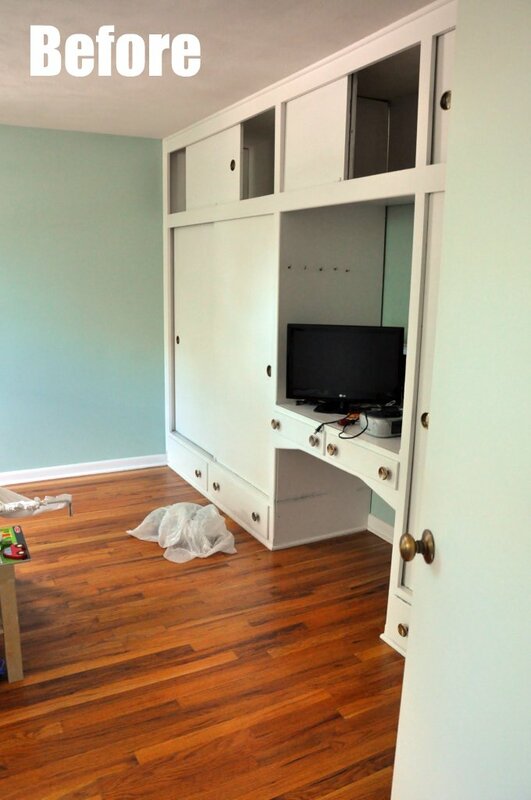 We chose one of the bedrooms with built-ins to be a playroom for Greta and a possible guest room as well. Here is the before shot. It was a lovely shade of greenish-blue, but I wanted it to be a cheerful, sunny yellow. 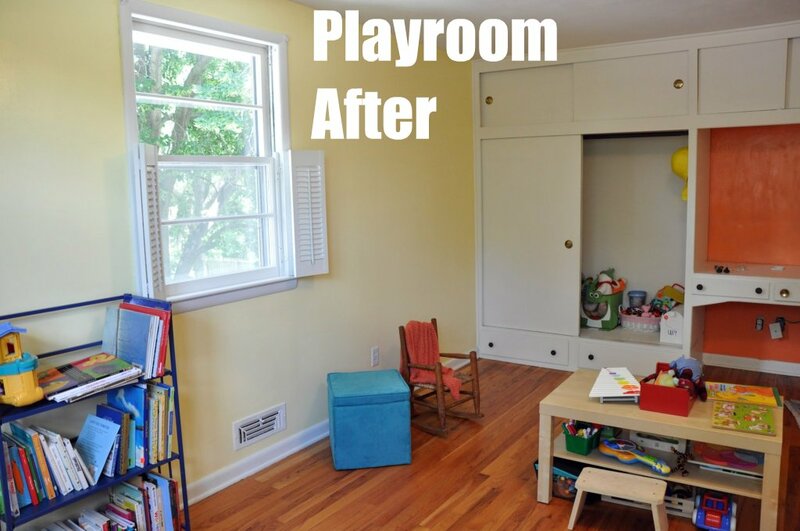 We used Pantone pastel yellow for most of the walls in the playroom. 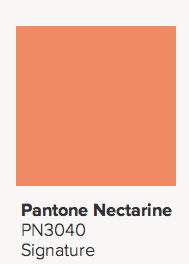 One accent wall was done in Pantone nectarine. 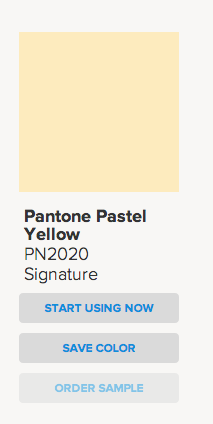 Both of these colors came from Lowe’s. 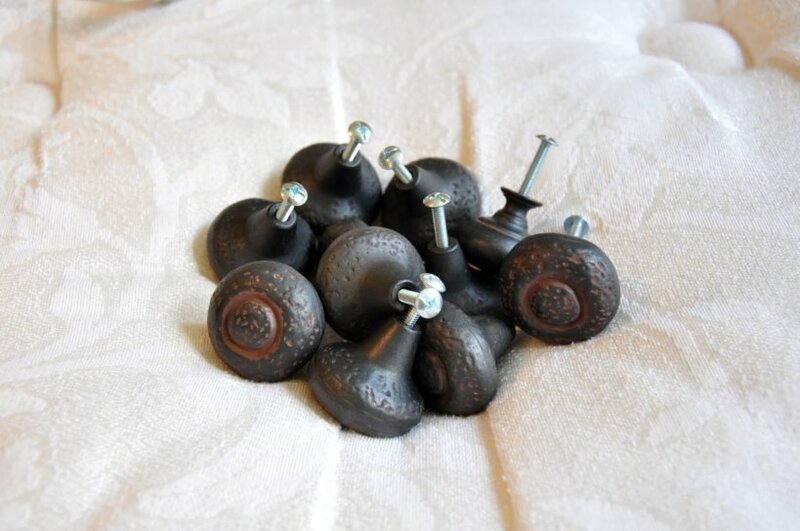 We found some nice cast iron knobs at Habitat for Humanity Resale Store. 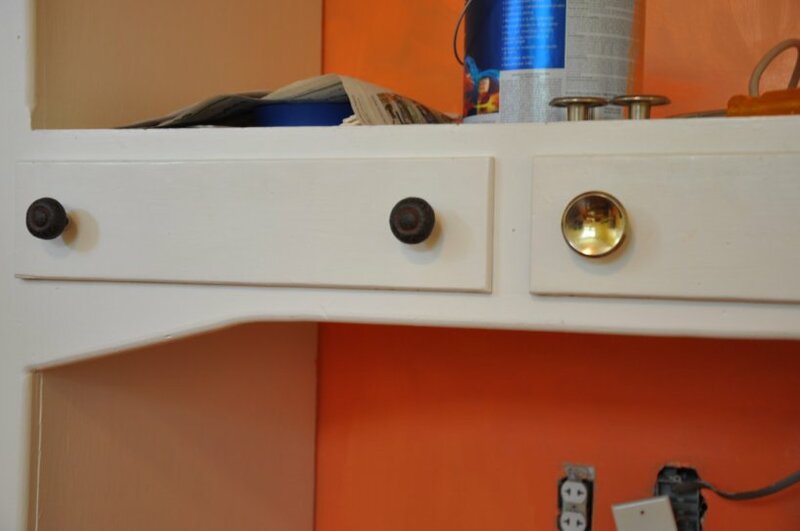 The left knobs are the new ones, the knobs on the right are the old ones. Much classier, if you ask me. 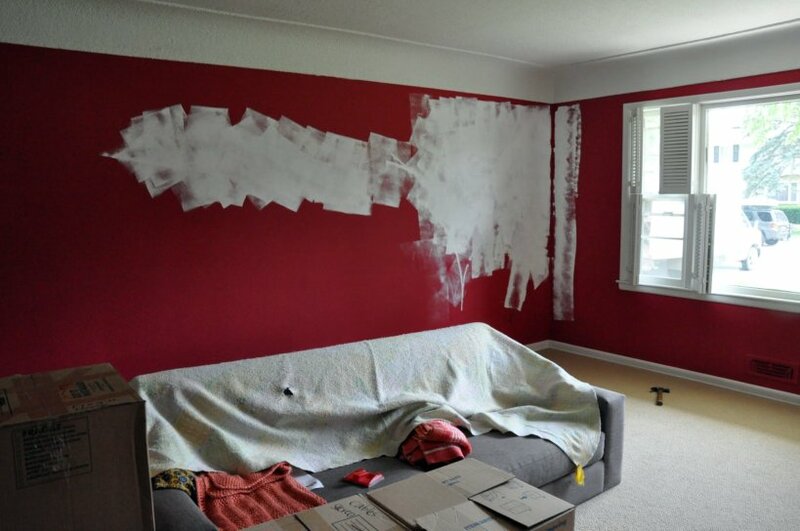 Save some artwork, window treatments, and a large rug, this room is complete. 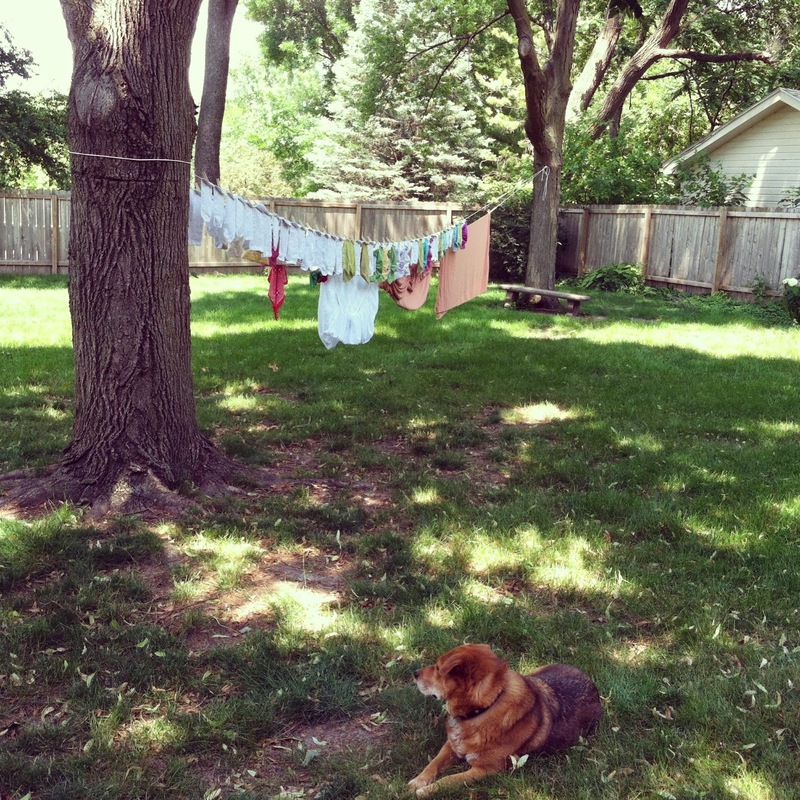 I really wanted to get Greta’s play area done first so she would feel more at home in the new house. I also wanted this to be her birthday present from us. More on her birthday later. Hope your July is off to a fun start. I can hardly believe we are into July already!